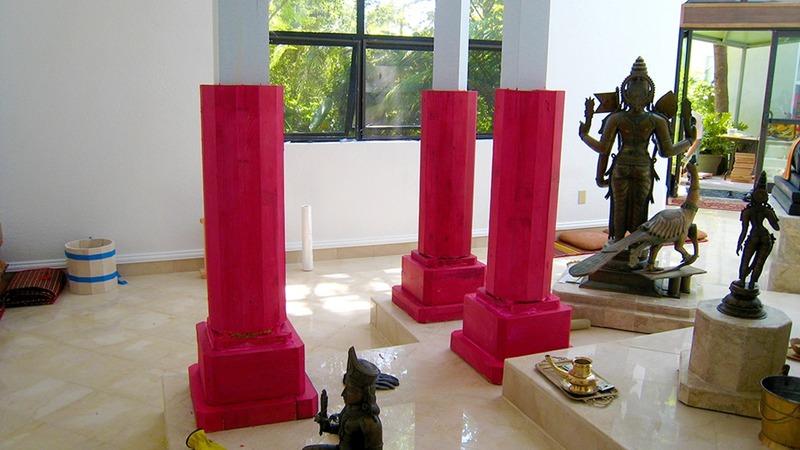 Building the columns of the Sadisvara Mandiram was an amazing and joyful undertaking. 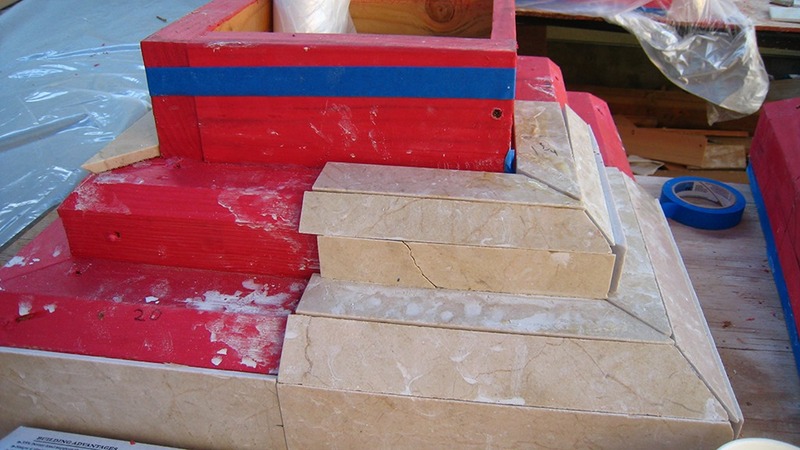 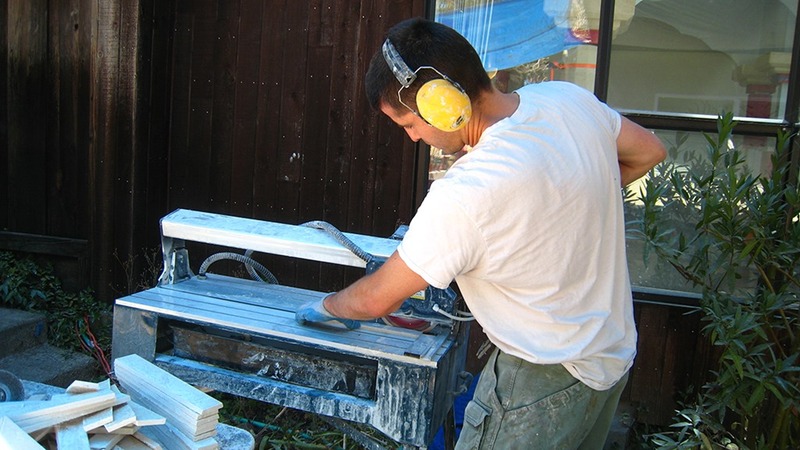 Literally hundreds of pieces of marble were cut for this part of the project. 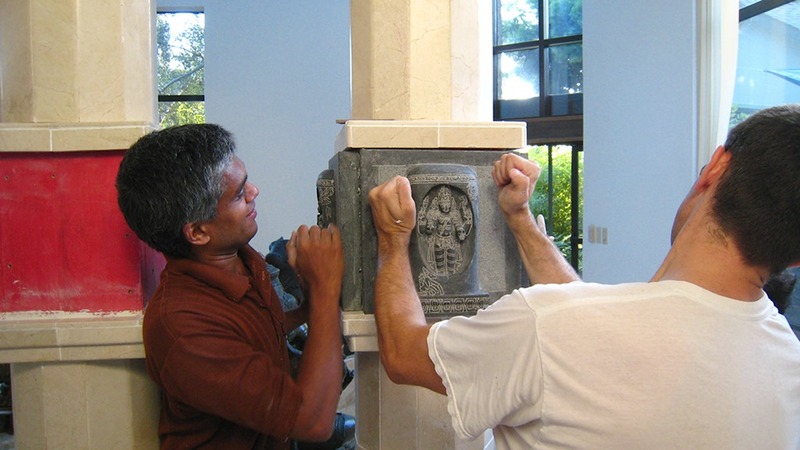 Below we share images of devotees building the columns. 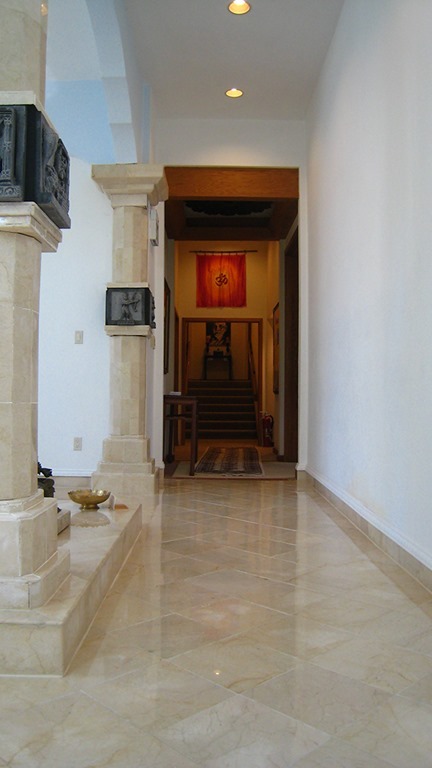 Above, the columns are shaped. 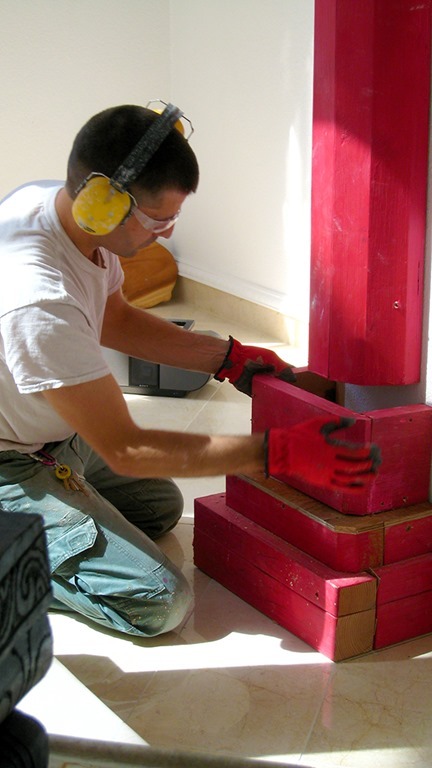 The structures are made of wood and covered with a waterproof substance (that is the red stuff). 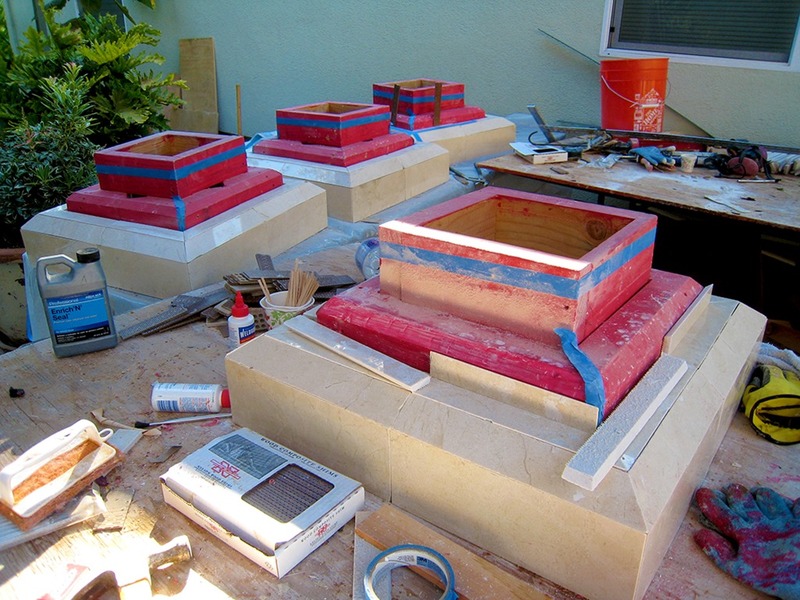 The tiles will adhere to these structures. 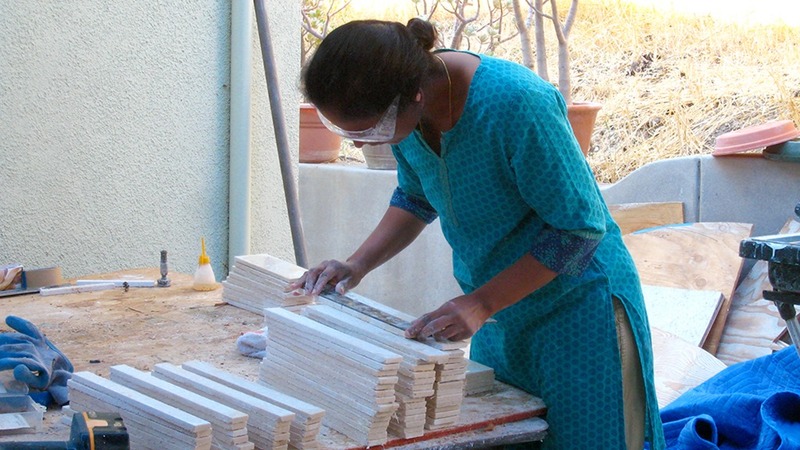 Here, Sangeeta and Shermilla cut and organize the different pieces of tile. 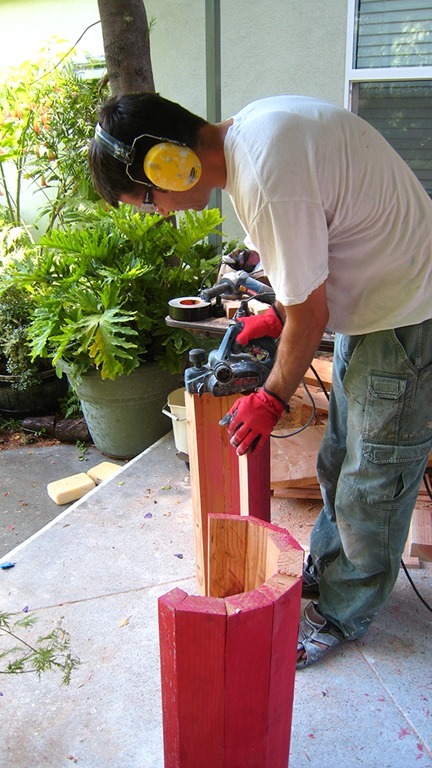 Scott continues to build the wood column structures. 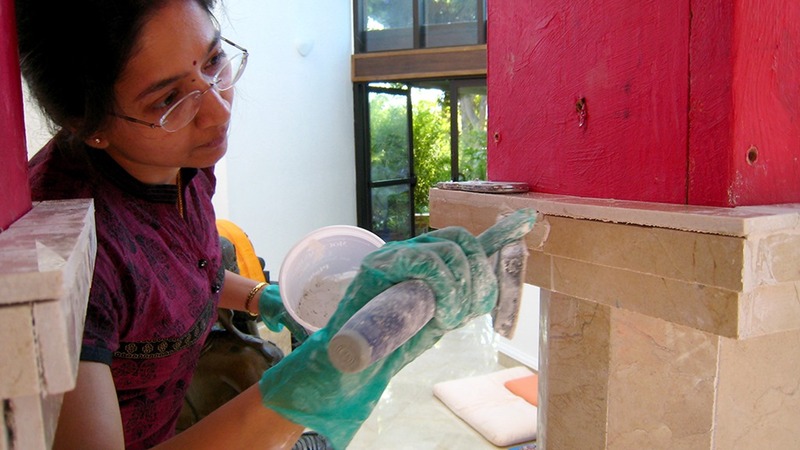 Jayalakshmi and Shermilla “glue” the tiles to the structure using a special adhesive. 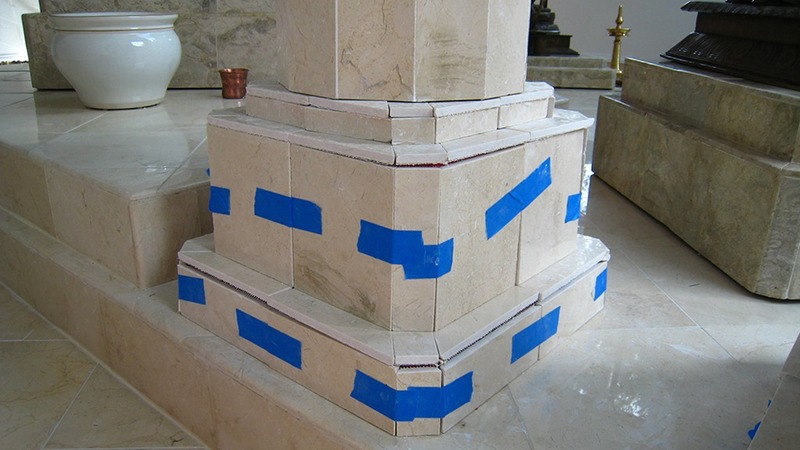 Once the tiles are in place, they are taped securely until the adhesive dries. 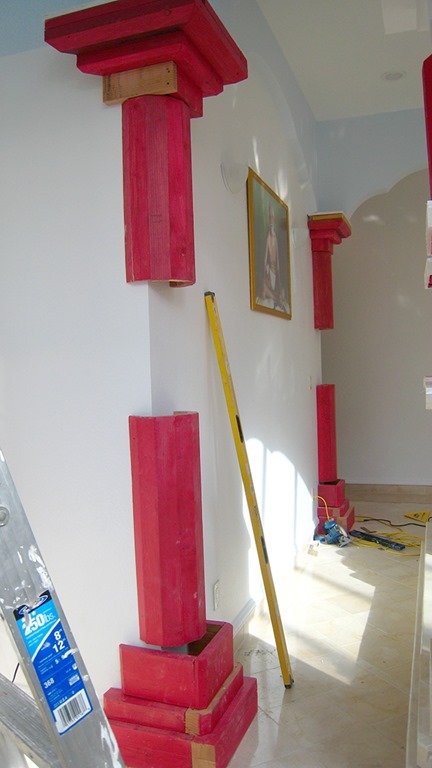 A section of each column is taped together ready to be placed on the wooden structures. 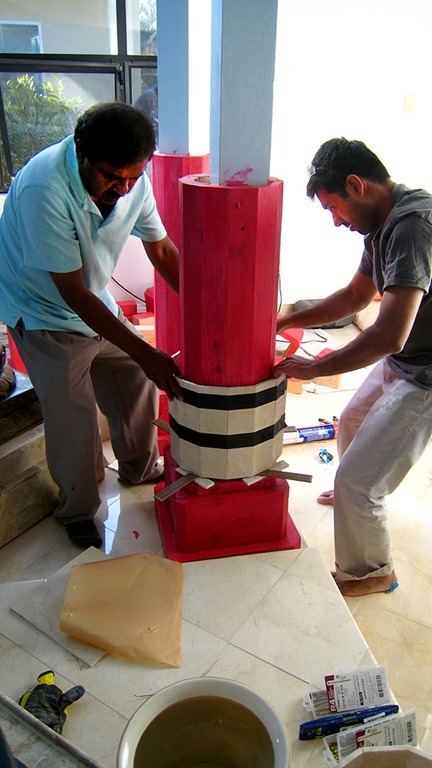 Scott applies adhesive to the wood column and Aravind and Gnana place a tiled section over the adhesive. 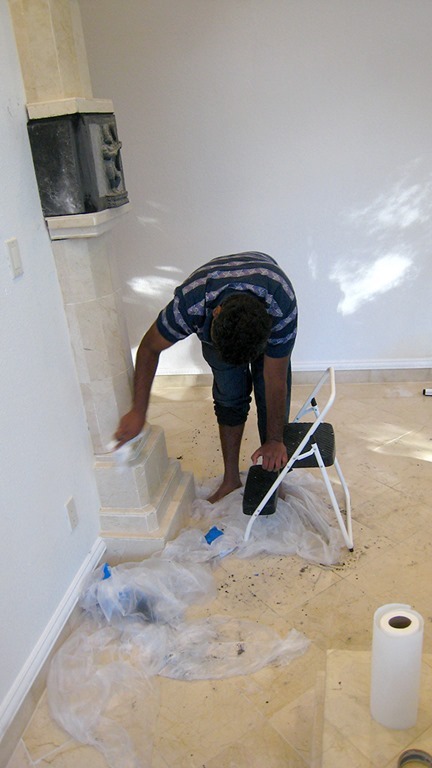 Care is taken not to allow any of the tiles to fall from the tape while it is being moved. 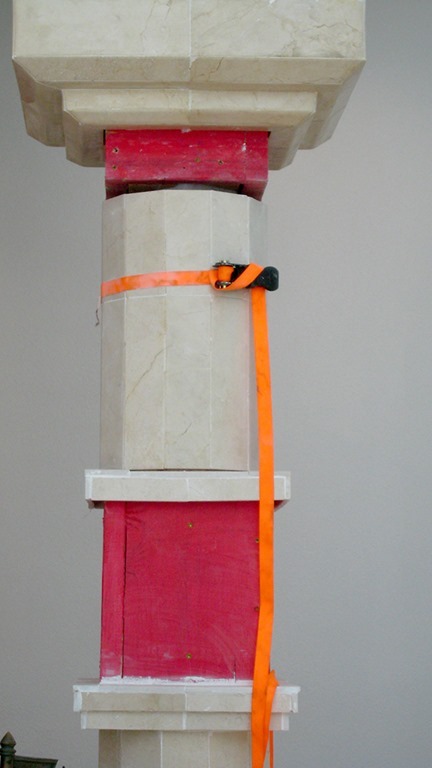 It is secured tightly until the adhesive is dry. 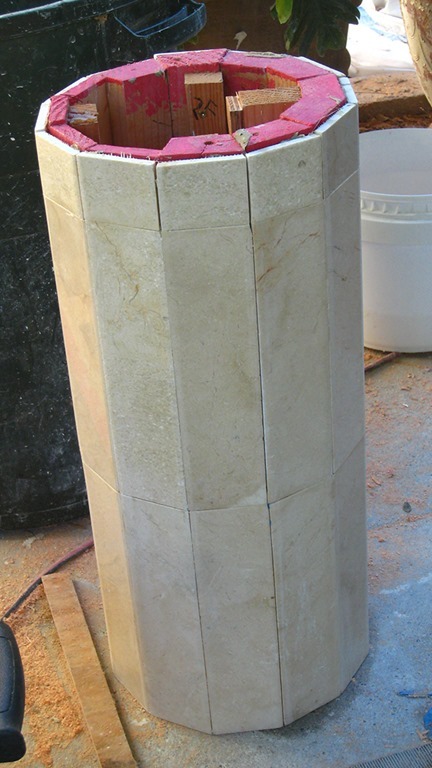 Three sections can be seen here that complete the bottom cylinder of this column. 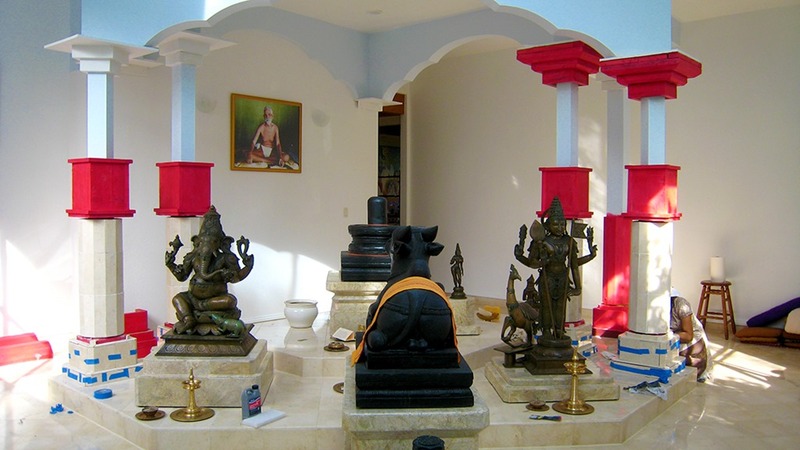 Siva places Sri Bhagavan’s picture on the wall. 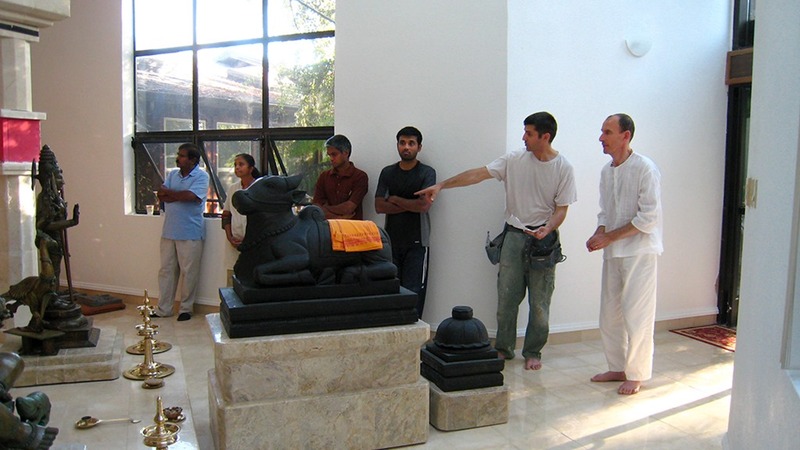 He is central to the Mandir and Nandi is gazing directly at Him. 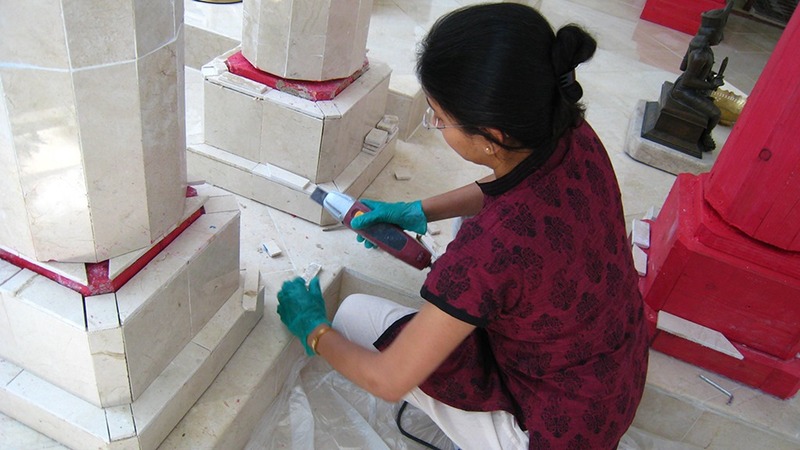 Sangeeta works with tile at the base of a column while Aravind paints the special waterproofing on the capitals of the columns. 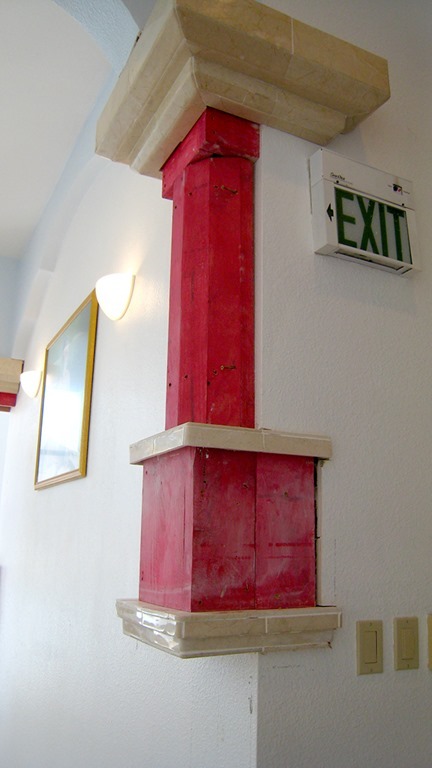 These capitals will be temporarily removed for the tile work later. 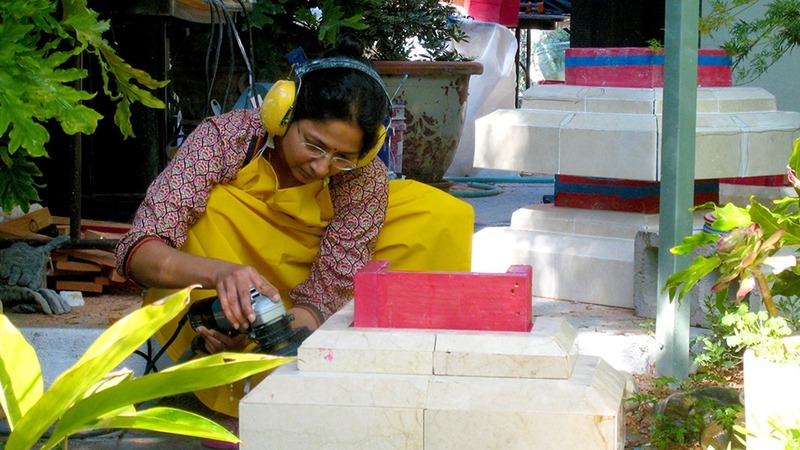 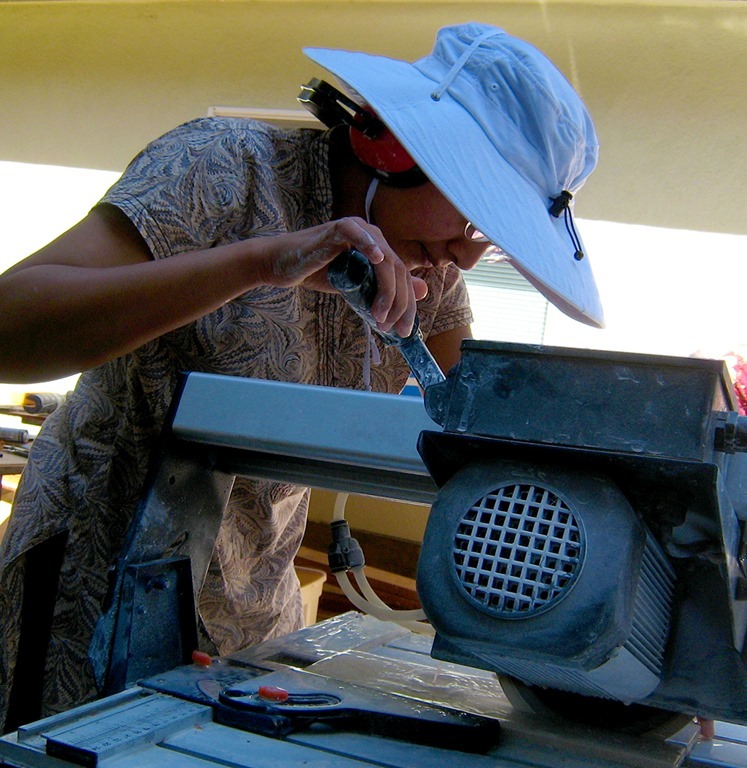 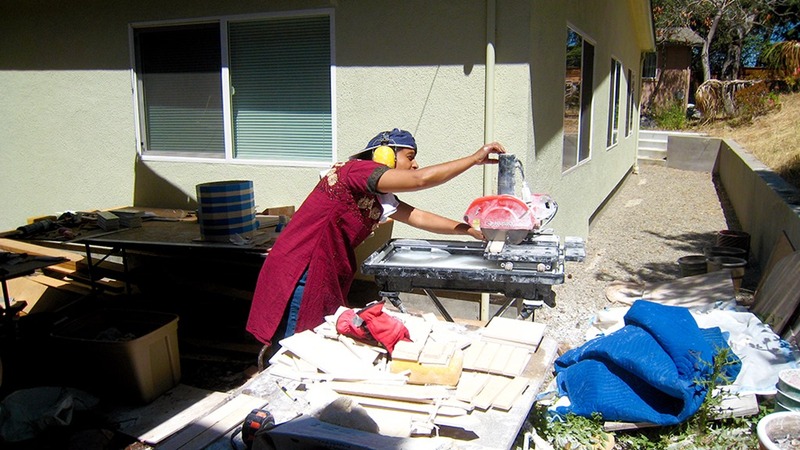 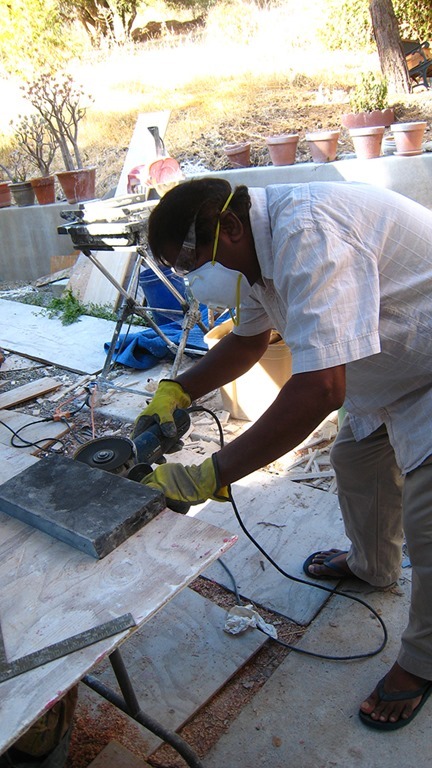 Ganesh, Shermilla, and Sangeeta continue to cut tiles. 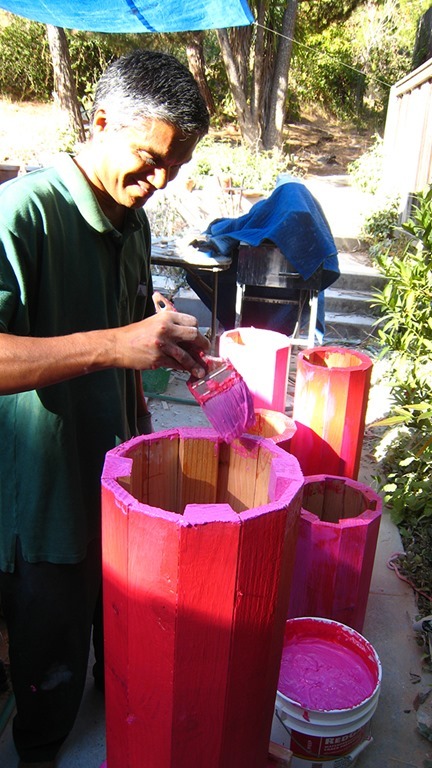 Scott continues to build the wooden structures of the columns. 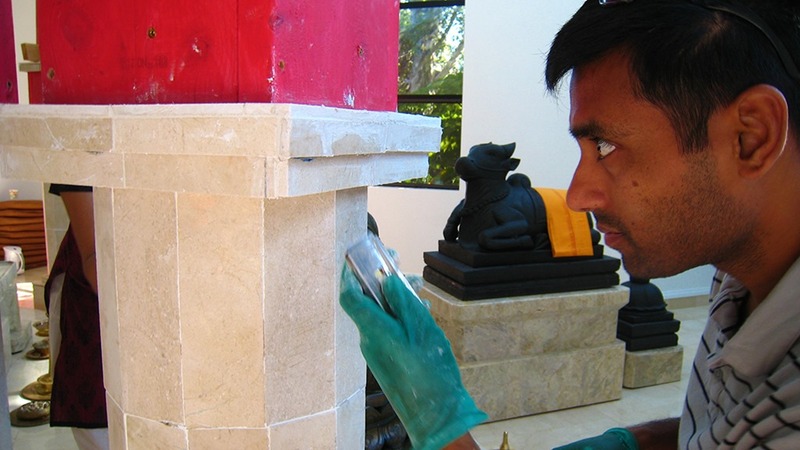 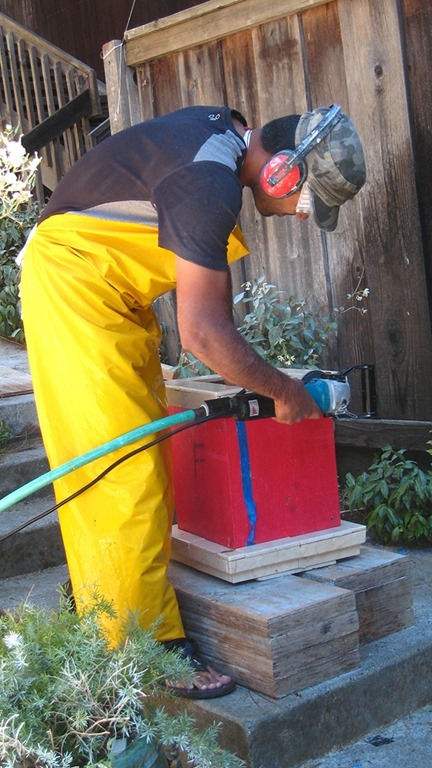 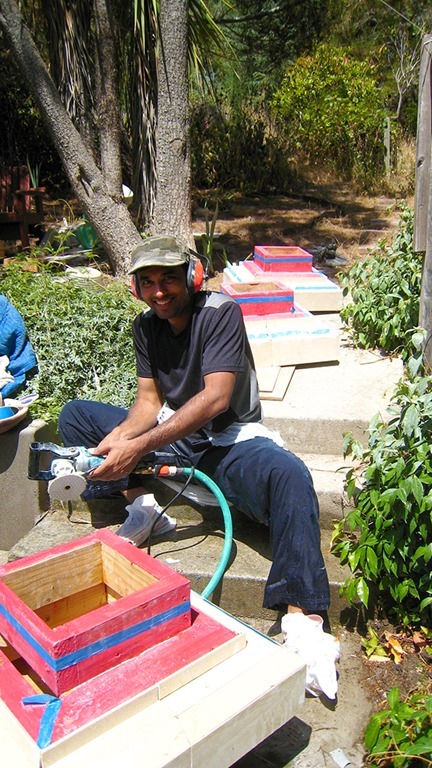 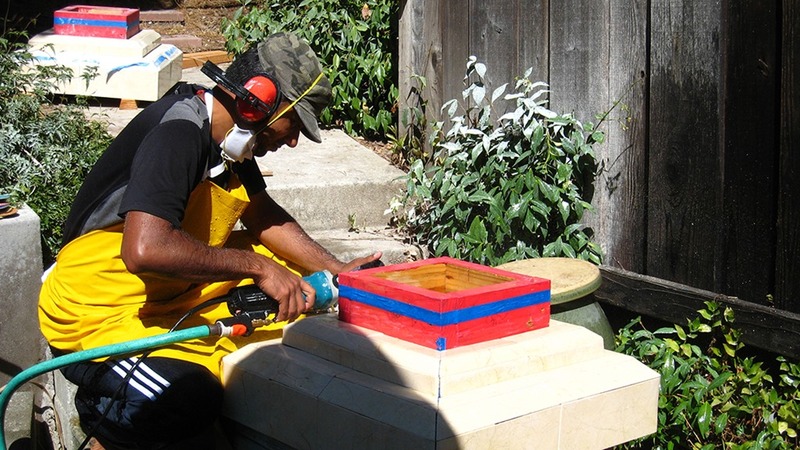 Ganesh continues to apply the waterproofing substance. 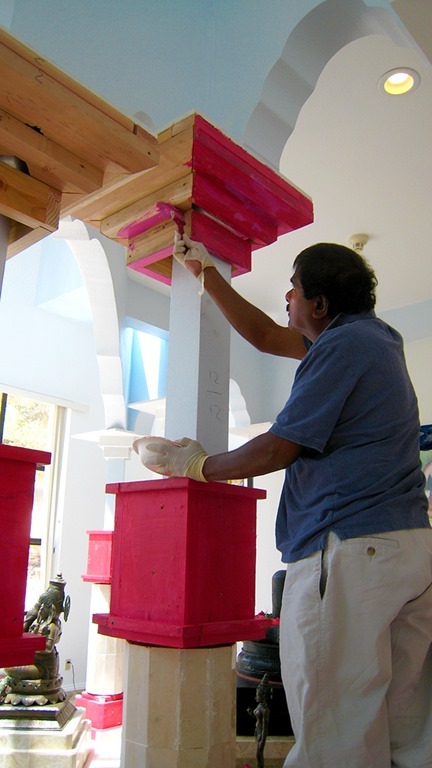 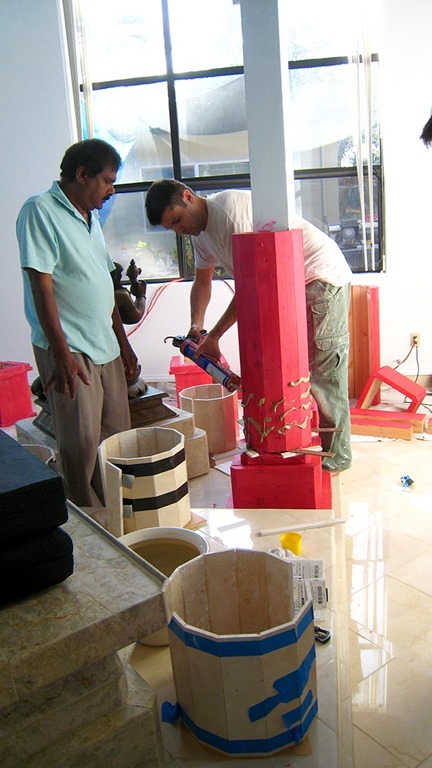 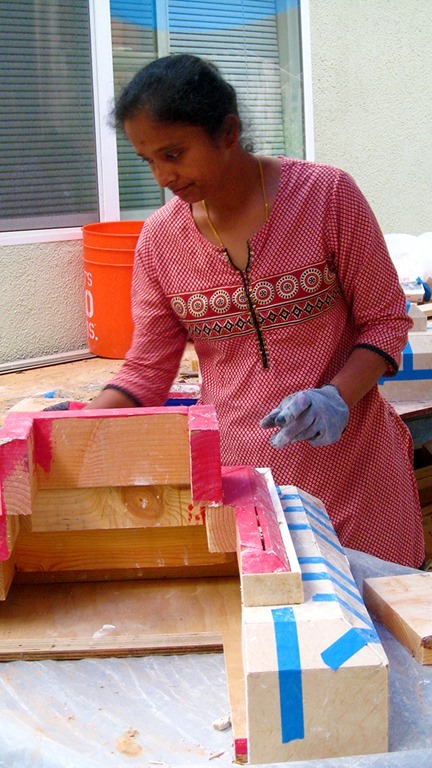 Siva finishes installing the wooden structures of the columns. 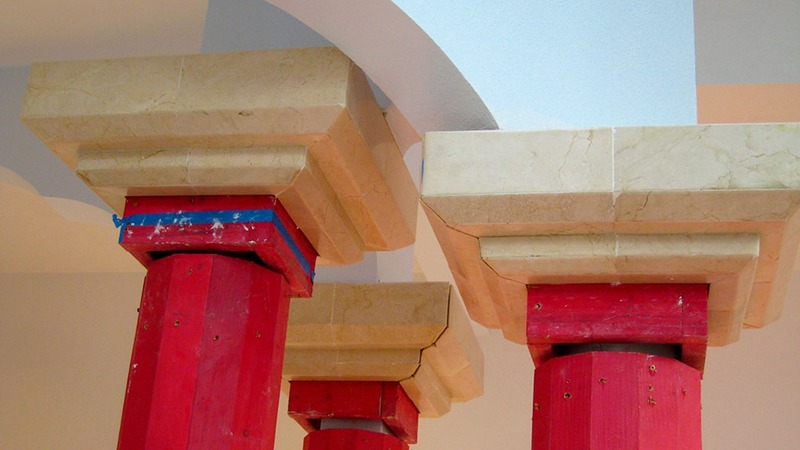 The capitals have now been removed from the pillars so that the tiles can be placed on them. 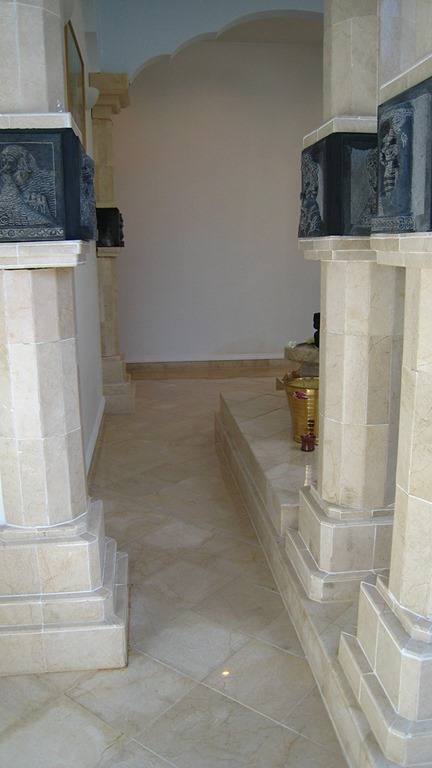 This was done for ease of tile placement and polishing. 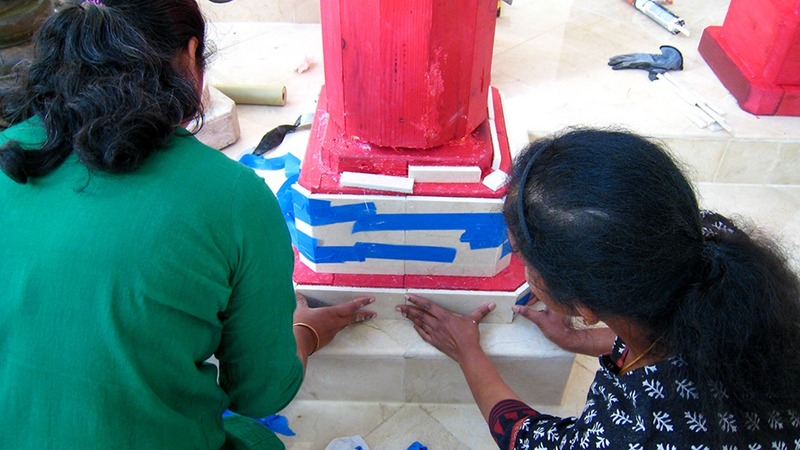 Gnana and Sangeeta continue placing the tiles on the column bases. 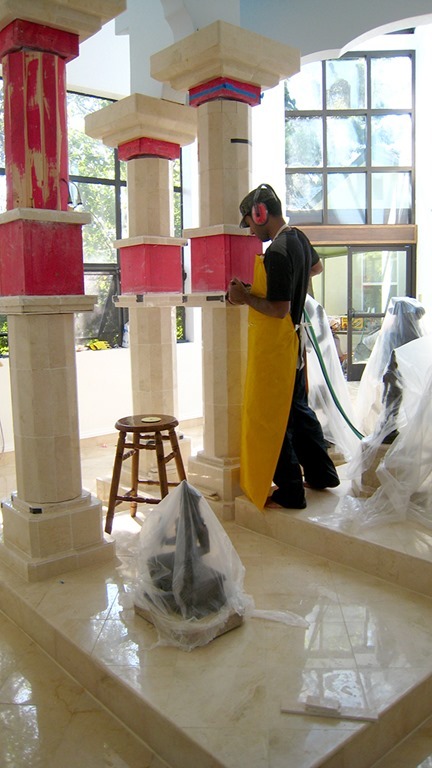 Scott works on the column capitals. 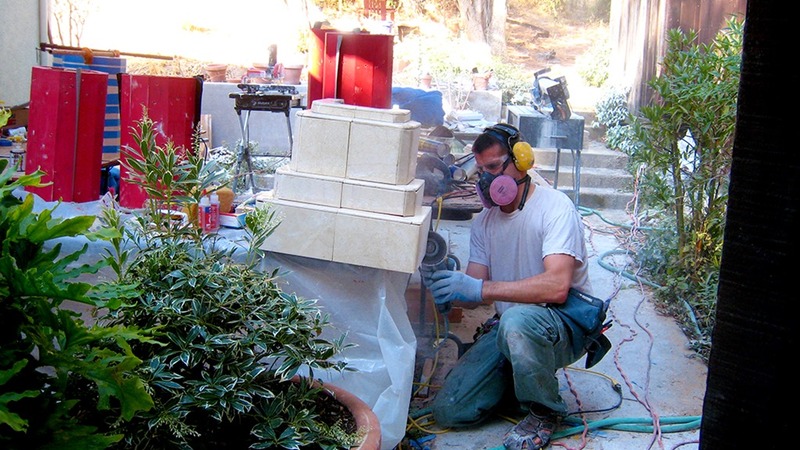 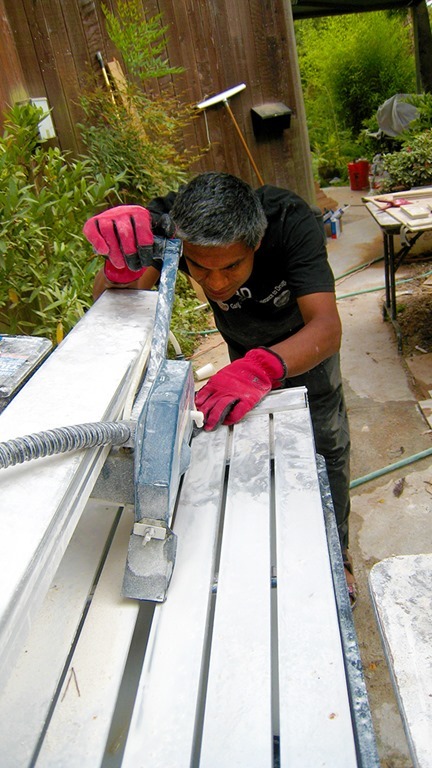 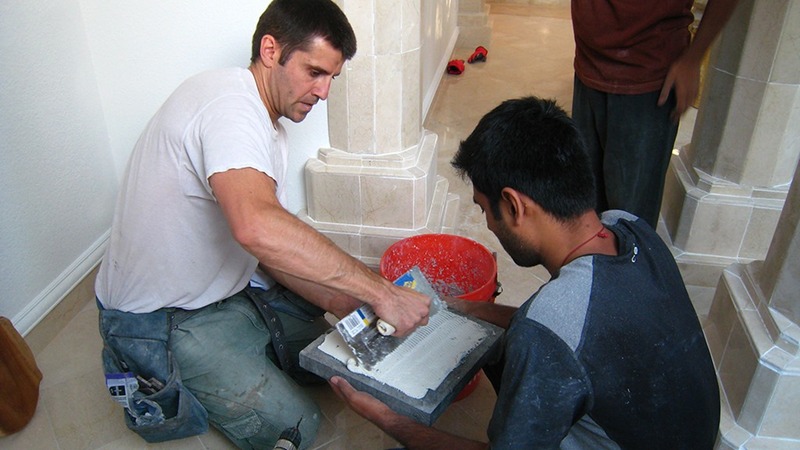 Some of the marble tile used in the Mandir is ground to be mixed with the grout in order to give the correct color. 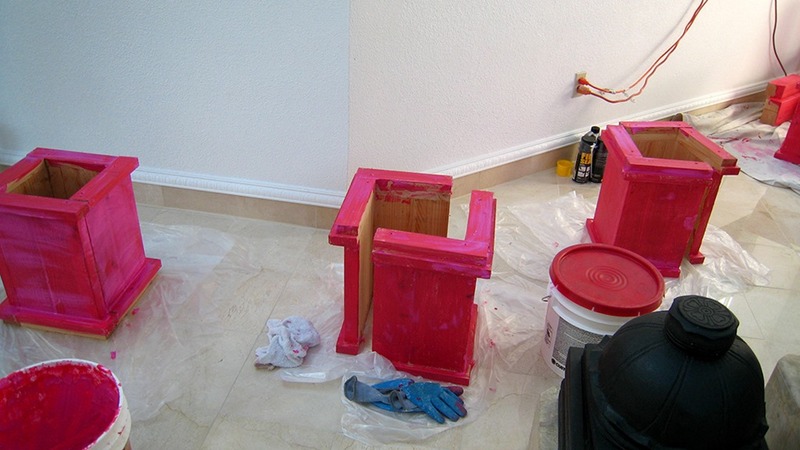 Here Smt. 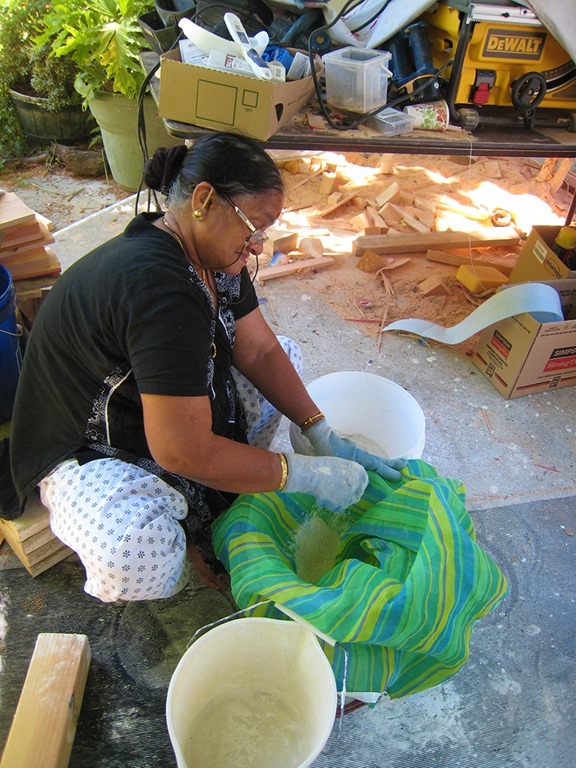 Vasantha sifts the ground tiles making a fine powder into which the grout substance will be mixed. 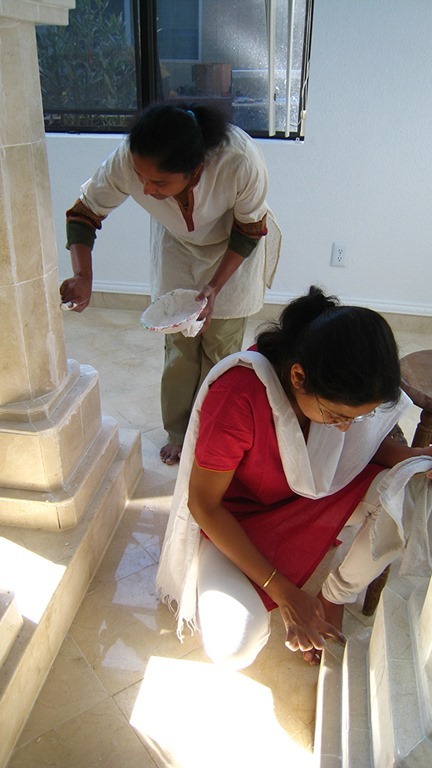 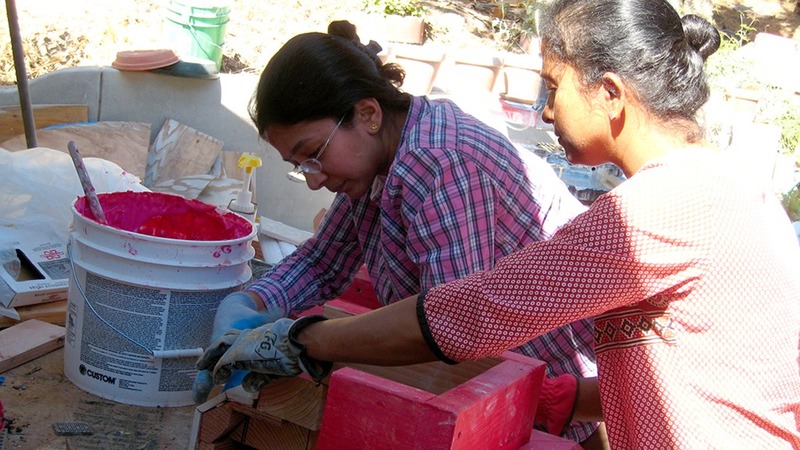 Sangeeta and Gnana apply the grout. 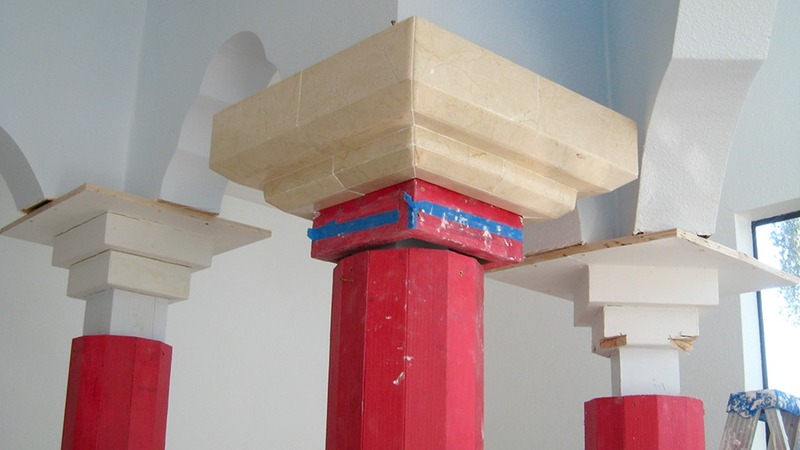 Tiling the capitals of the columns in progress. 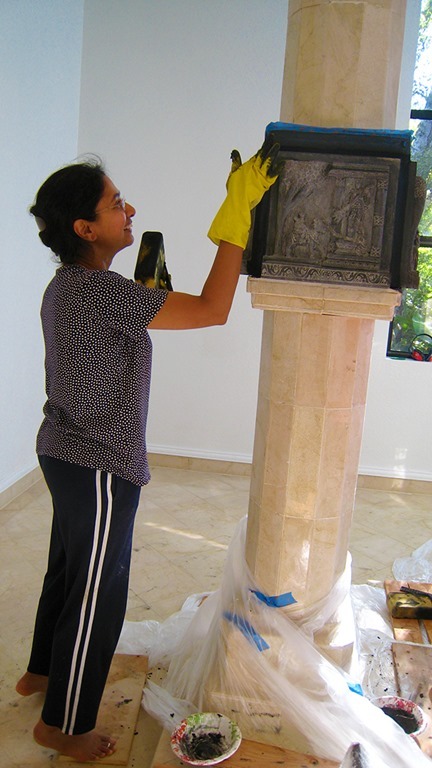 Gnana polishes the tiles on the capitals while Sangeeta continues to adhere tiles. 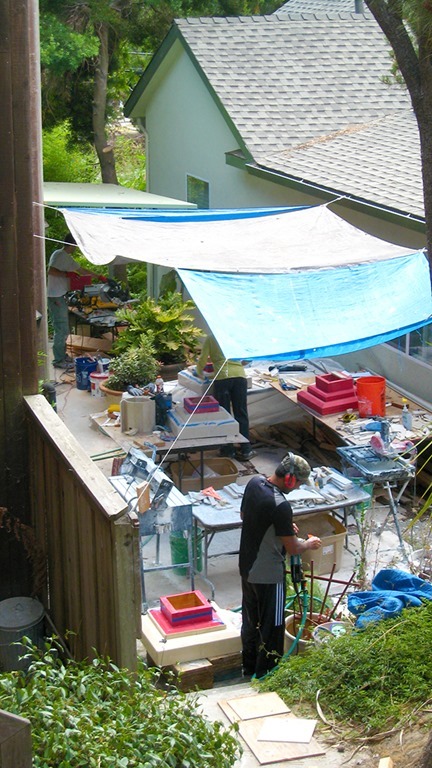 The work area as seen from the back door of the Satsang Hall. 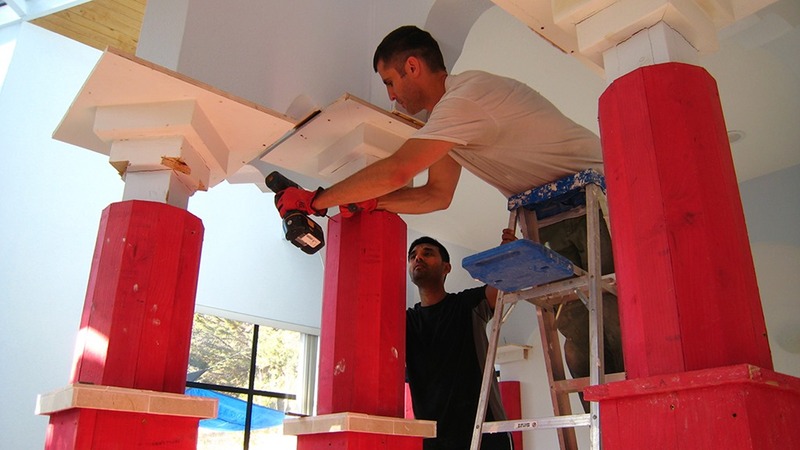 Scott builds the half columns and installs them. 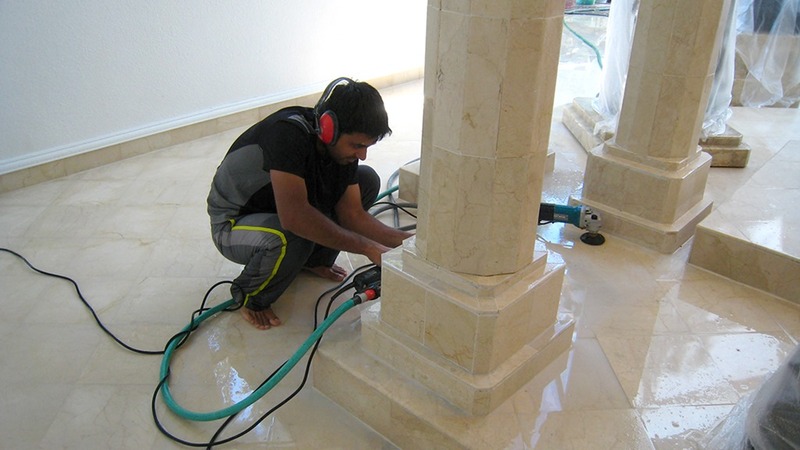 More construction, more adhering tiles, more polishing. 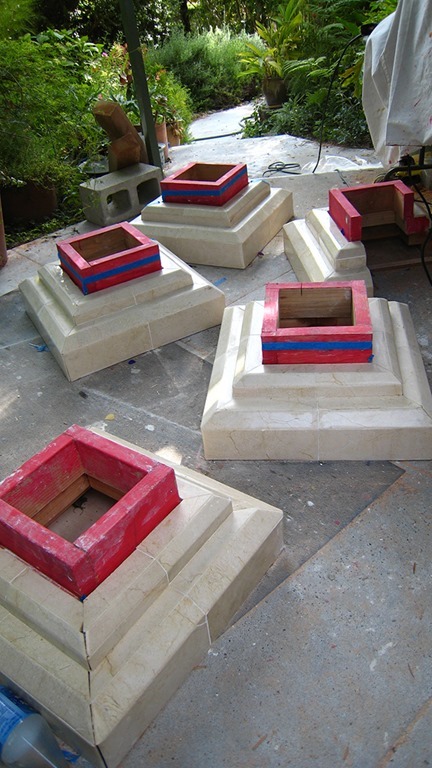 There are 7 columns total needing bases and capitals. 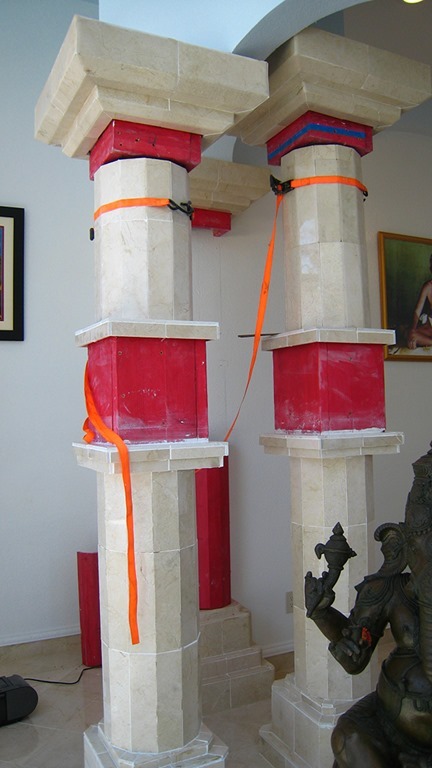 The capitals are ready to be hung. 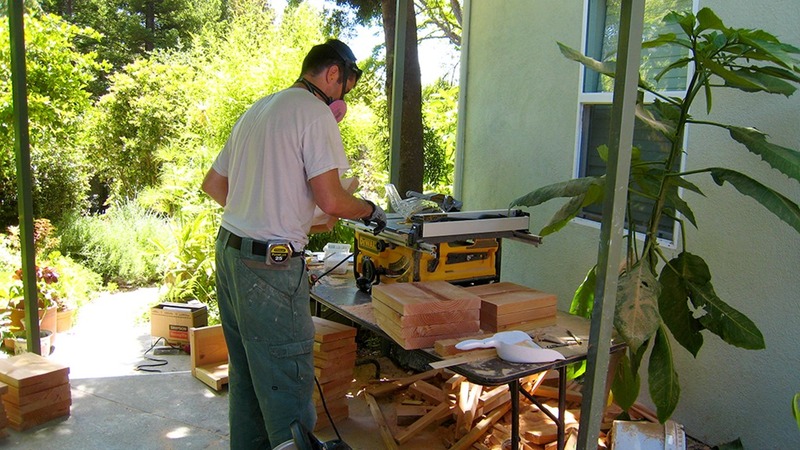 Scott makes preparations. 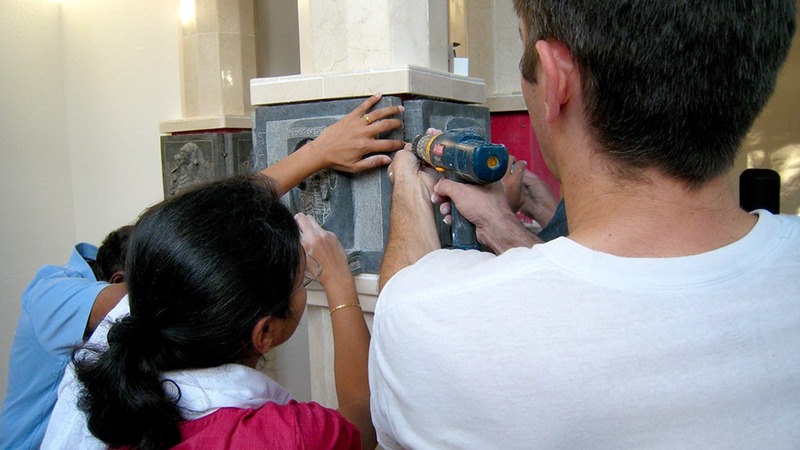 Scott and Gnana install the first capital. 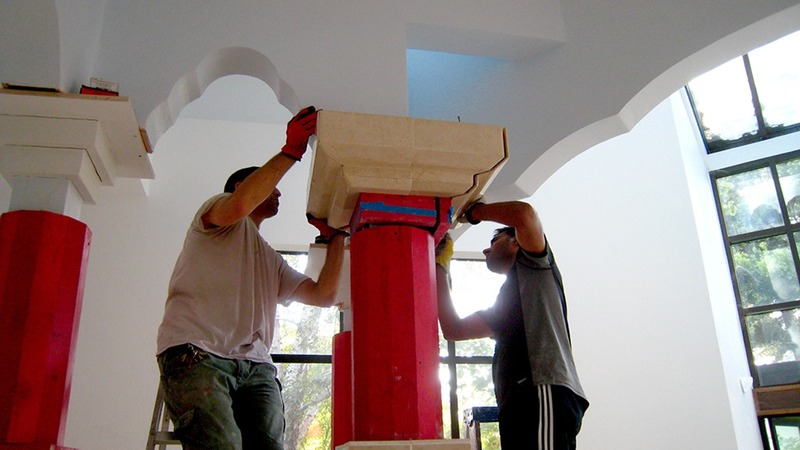 One by one each capital is placed in position on the tops of the columns and secured until the adhesive dries. 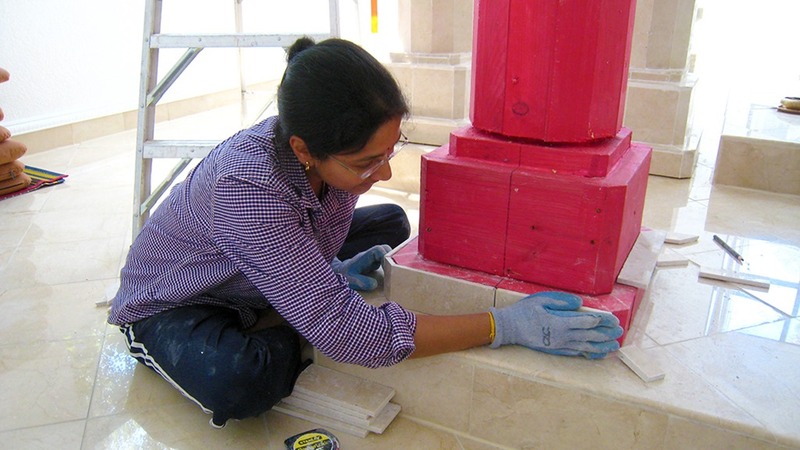 Shermilla measures the tiles making sure they are the correct size. 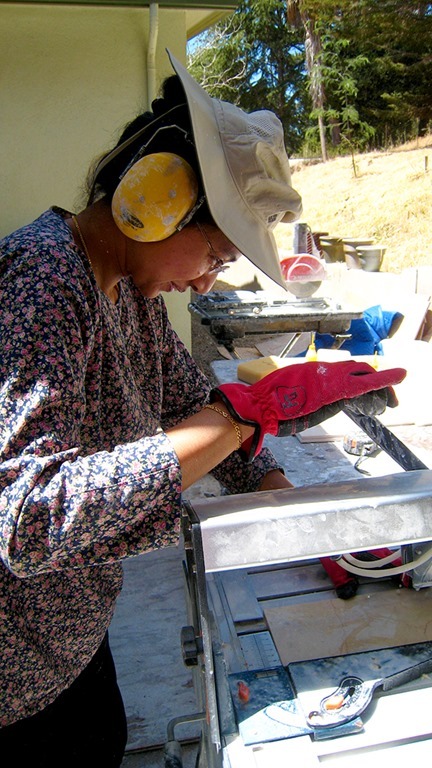 Sangeeta works on another base. 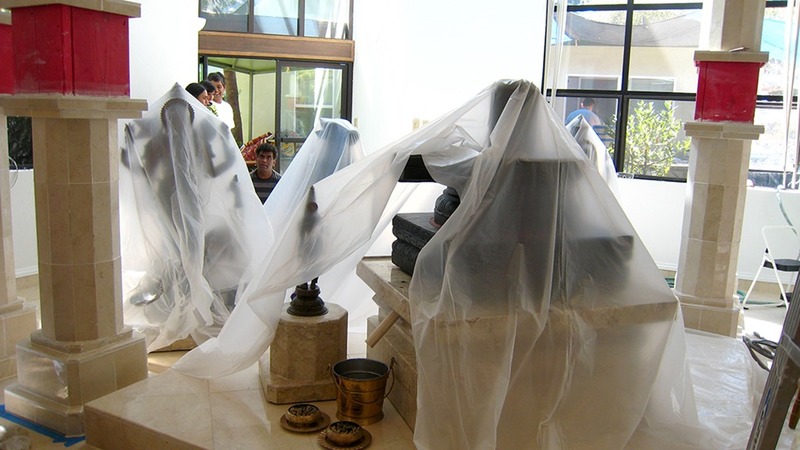 The two in the background are already complete. 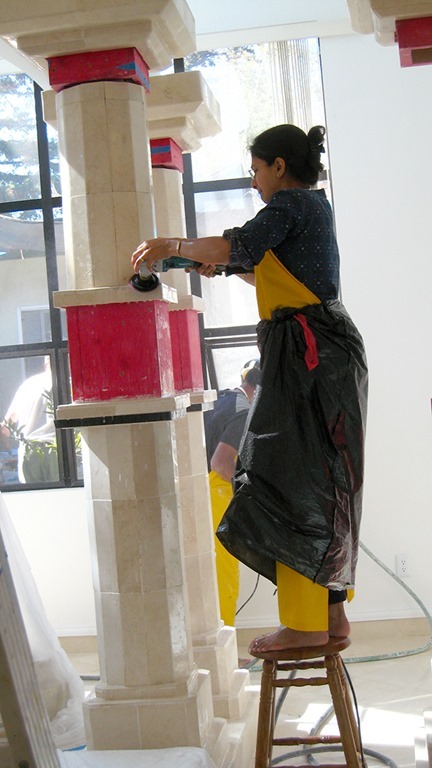 More tiles are glued and taped ready to be hung on the wooden structures of the columns. 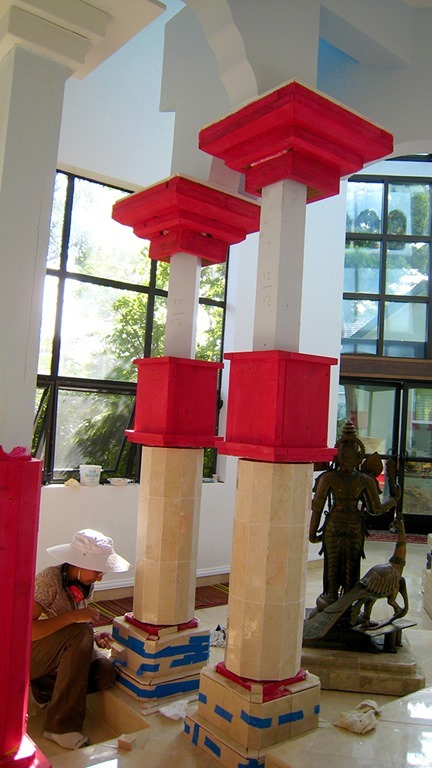 The children have fun building their own temple structure. 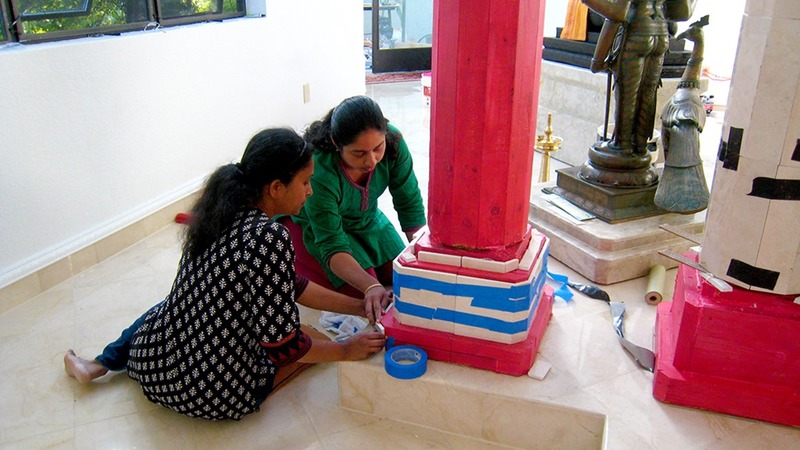 Here, Janani and Sruti build a temple. 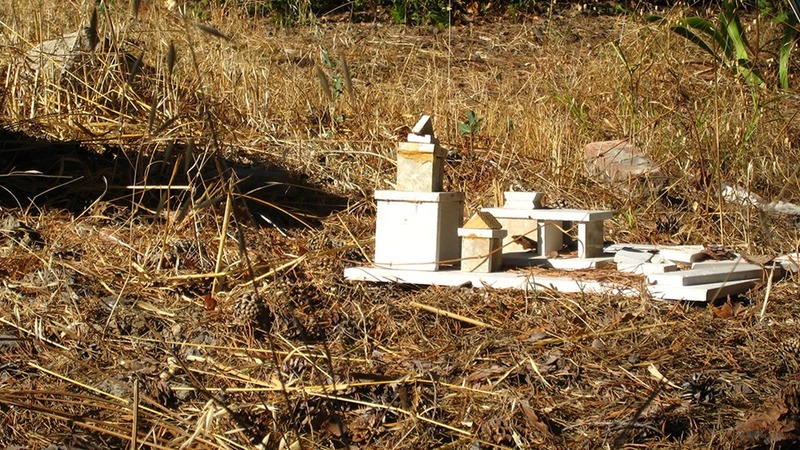 It looks remarkably real in the distance. 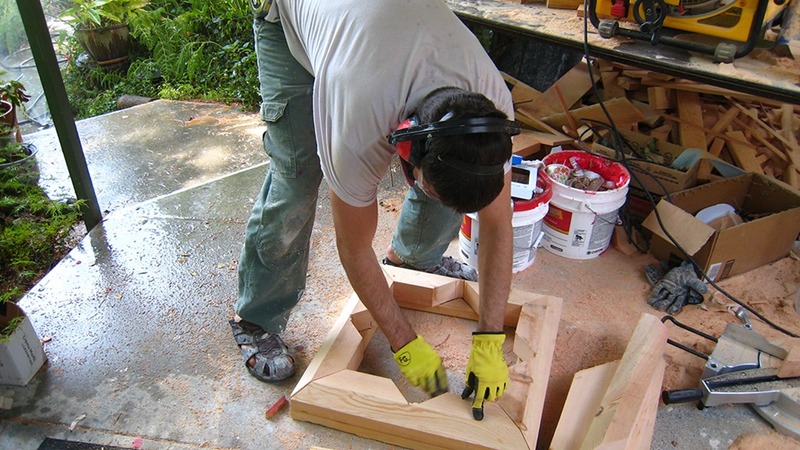 Scott polishes a base. 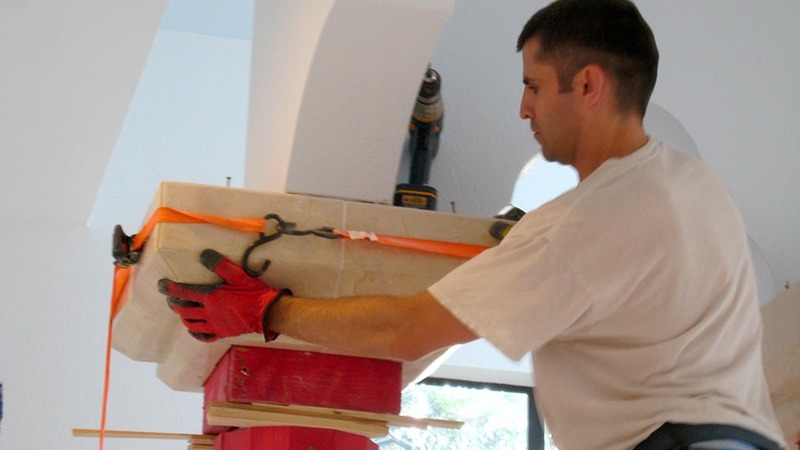 More tile is cut. 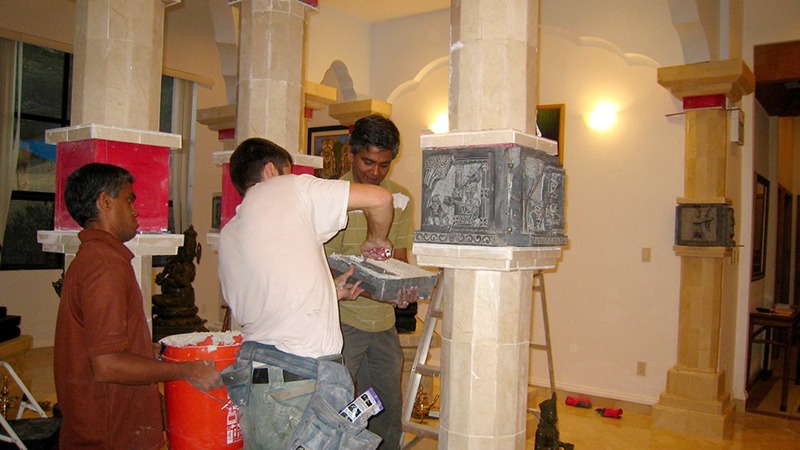 Bit by bit each column is closer to completion. 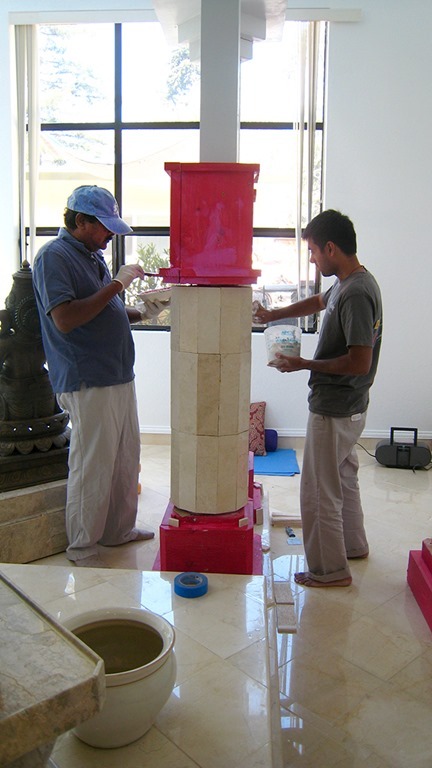 The bases of the columns are polished after they are installed. 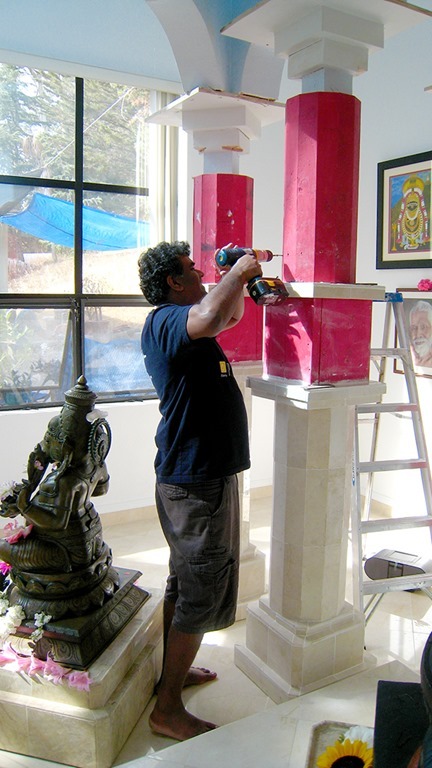 The Murtis and Siva Lingam are covered with plastic while polishing is occurring. 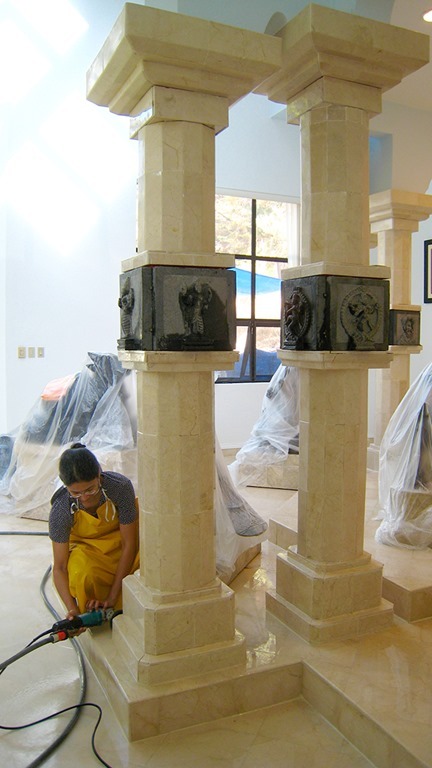 The polishing is a very wet job. 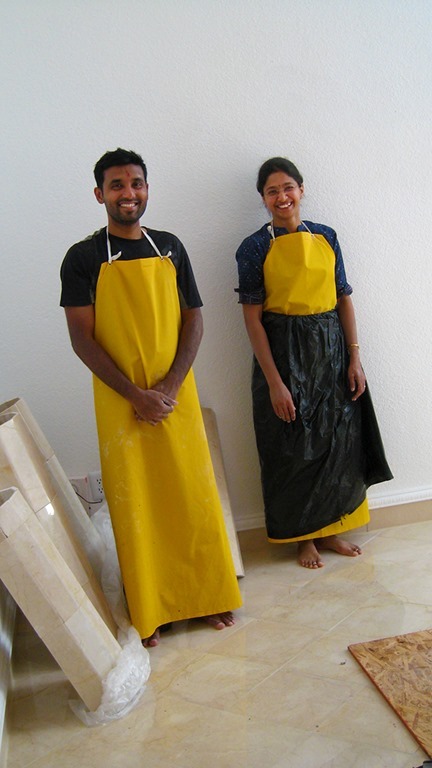 Gnana and Sangeeta are prepared with their aprons. 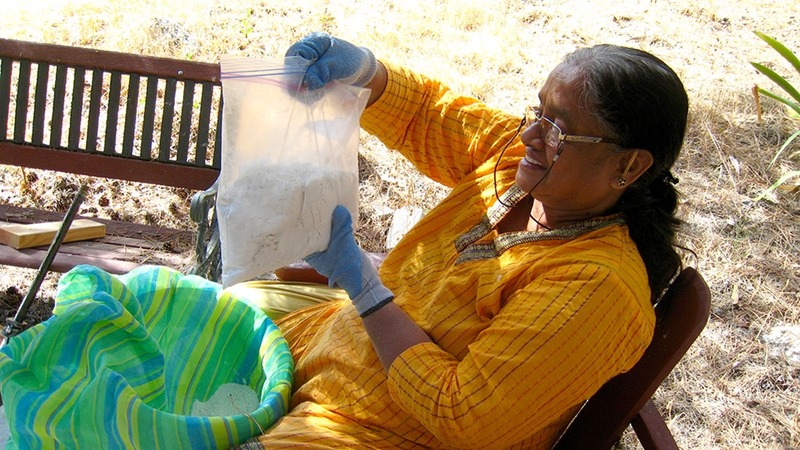 It’s time for everyone to take a chai break. 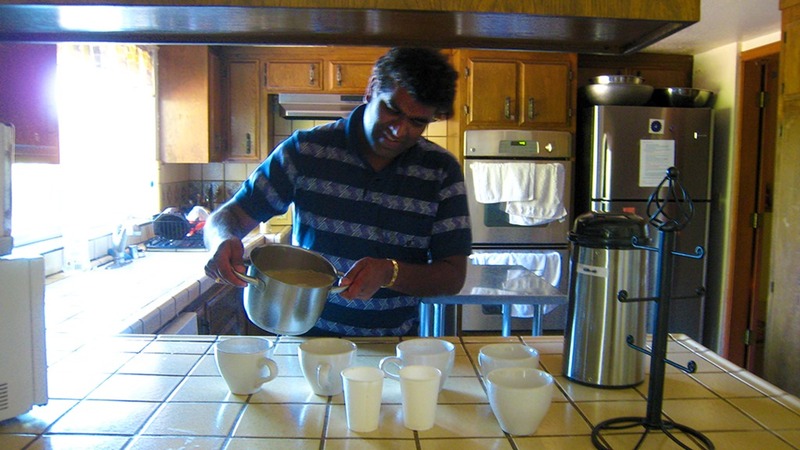 Siva is the chai guru. 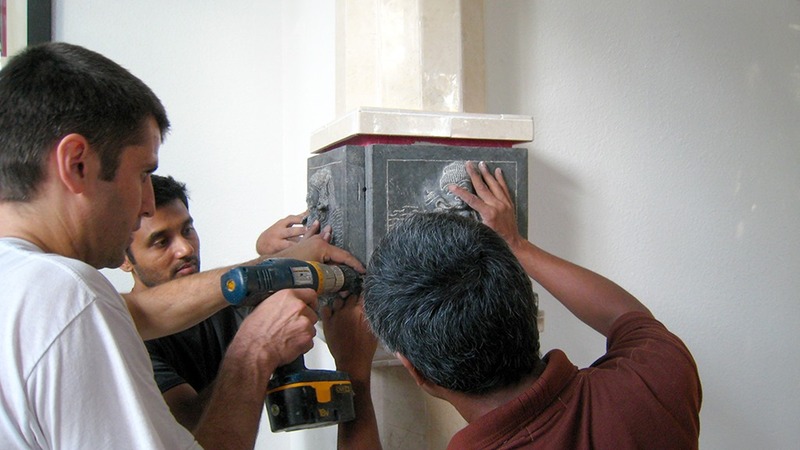 Raman and Aravind make sure the notches in the tiles are properly aligned. 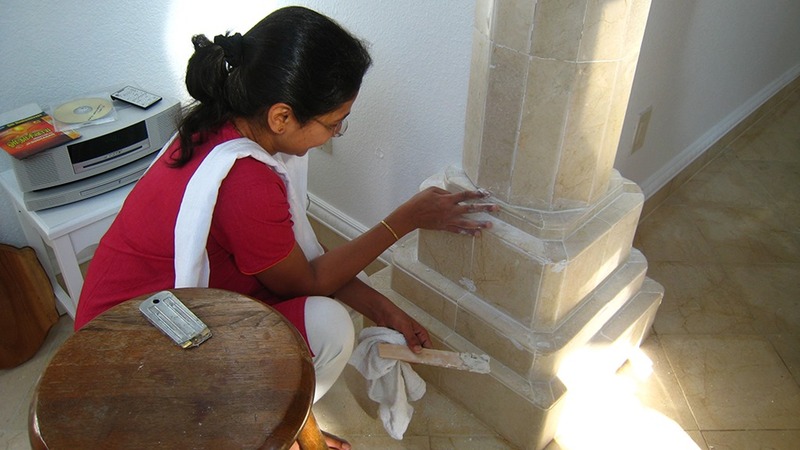 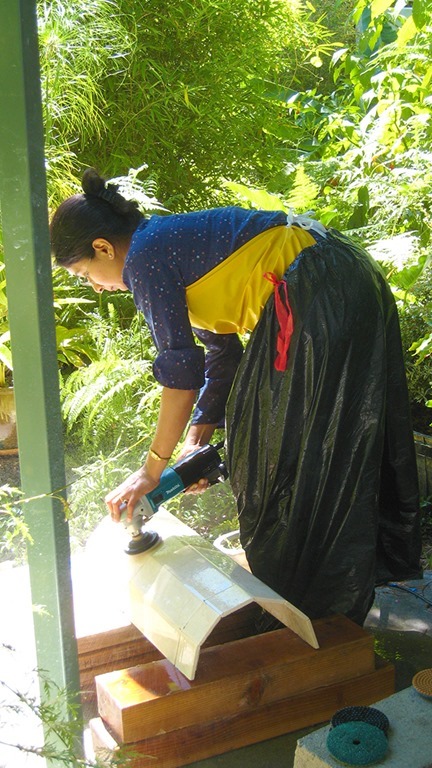 Shermilla and Sangeeta continue grouting. 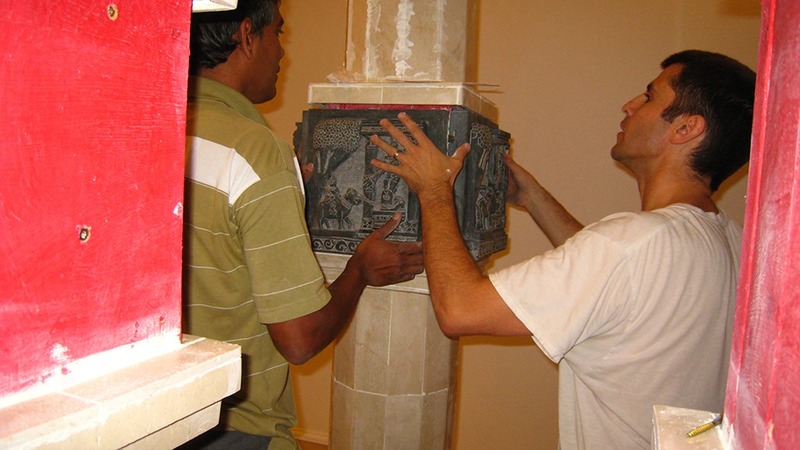 The “story” tiles are hung on the column. 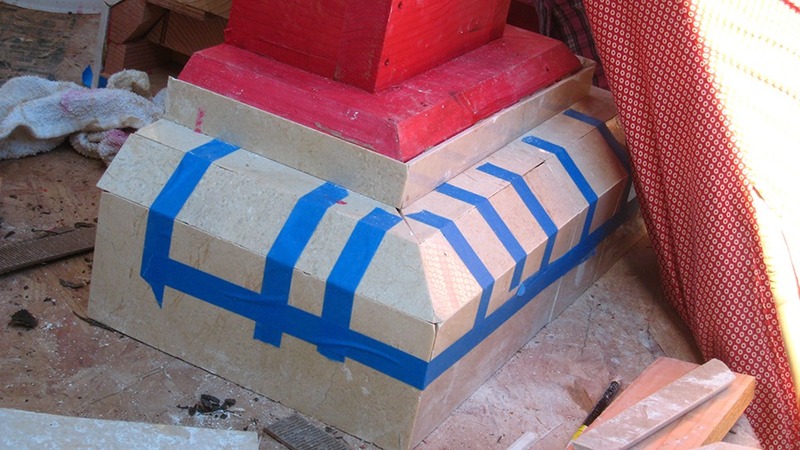 They are first glued and then a special clip is used to secure the two tiles together in their corners. 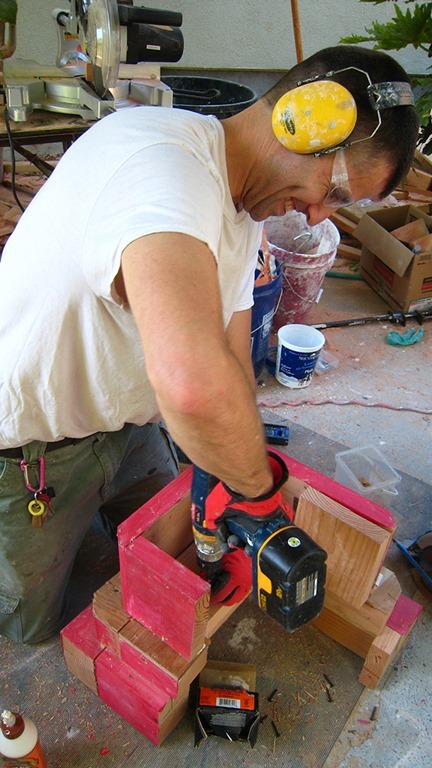 The notches, the clips and the screws can be seen clearly here. 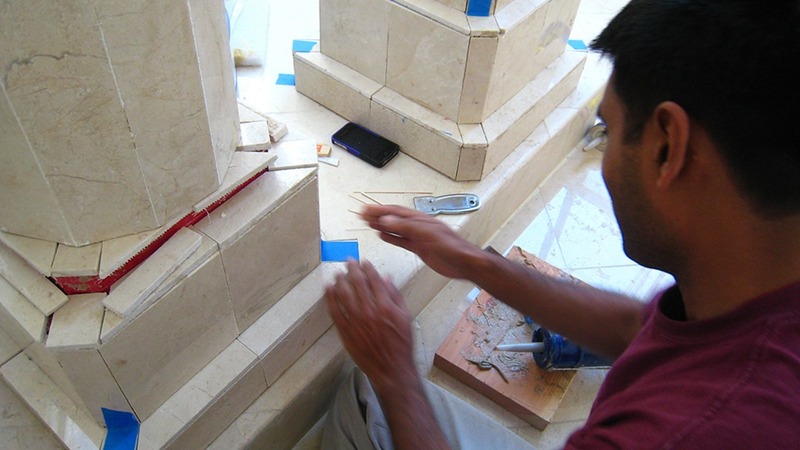 Each tile weighs approx. 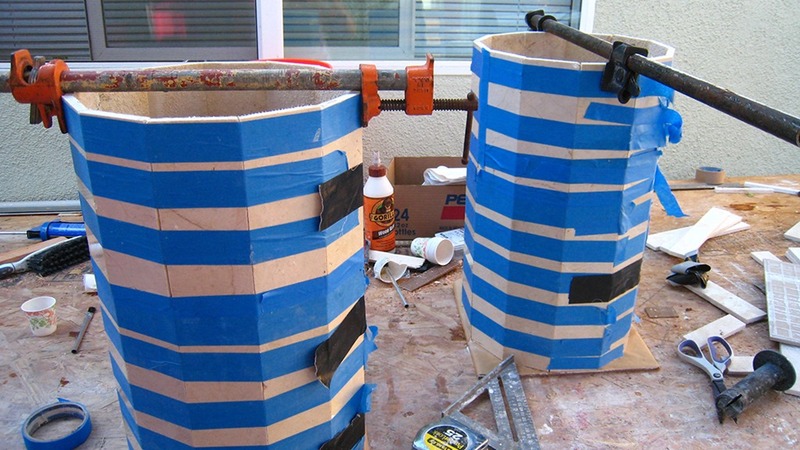 30-35 pounds so they must be very secure. 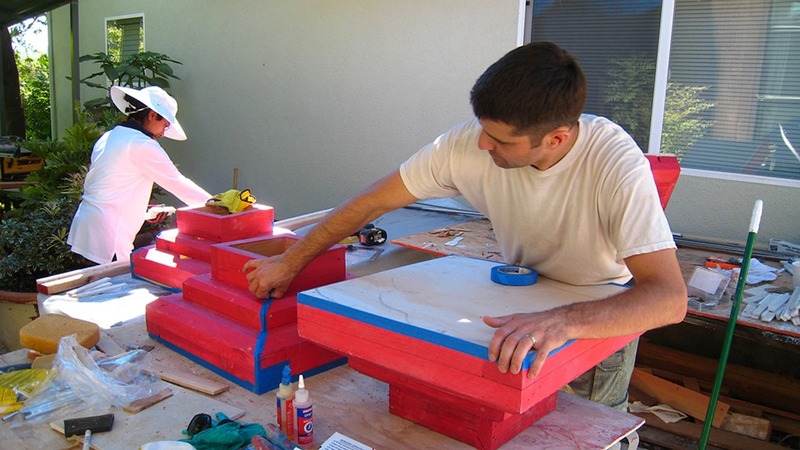 Scott and Nome discuss the placement of the story tiles. 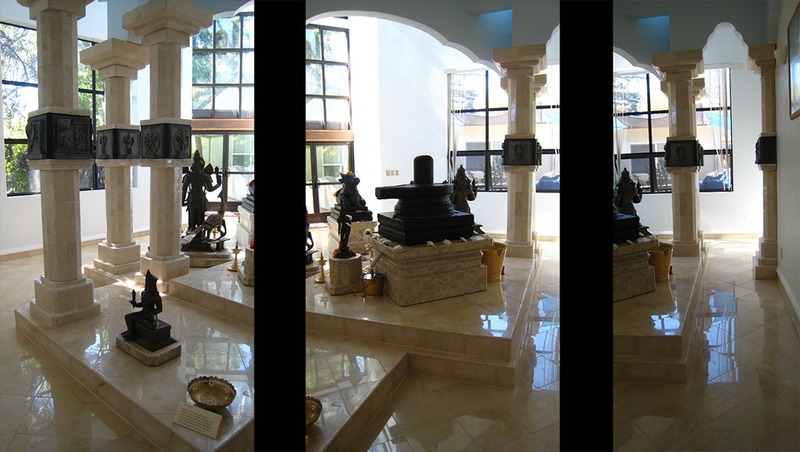 Devotees take a respite, enjoying the beauty of the Mandir. 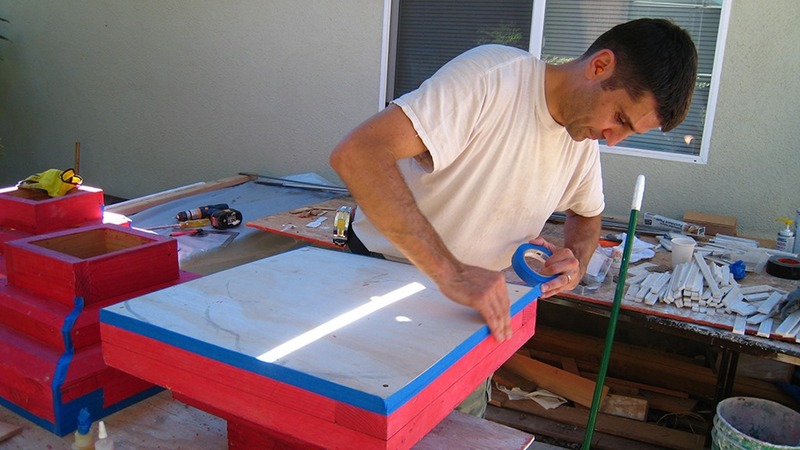 More story tiles are glued and hung. 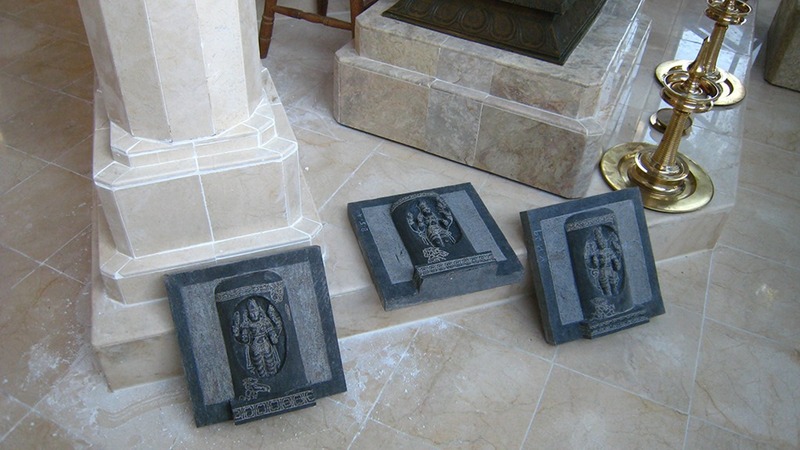 Lingodbhava story tiles rest waiting to be hung. 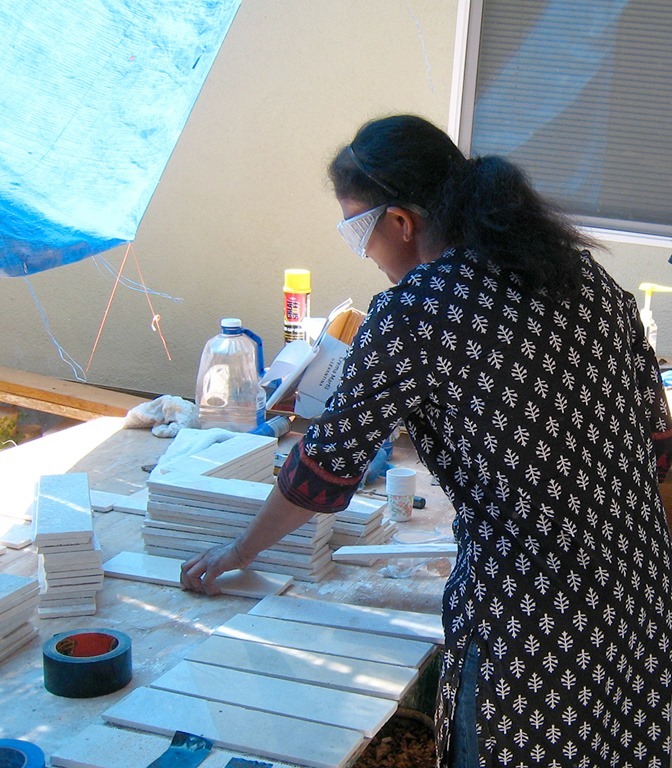 The story tiles are all hung and some final polishing is done by Gnana and Sangeeta. 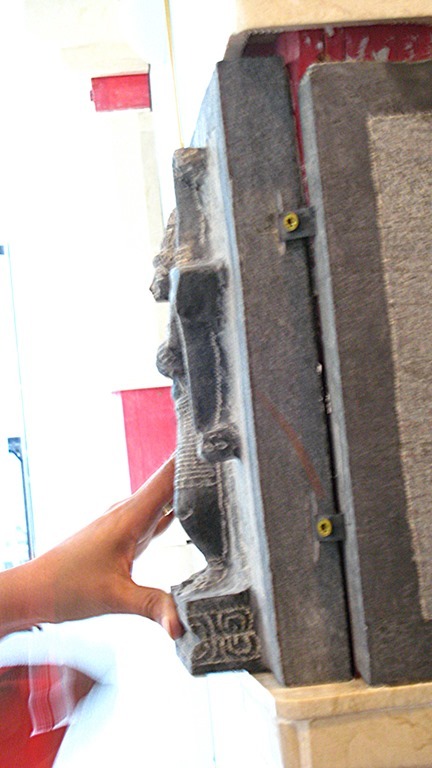 The final step in completing the story tiles is placing black grout over the special clips that were screwed in earlier. 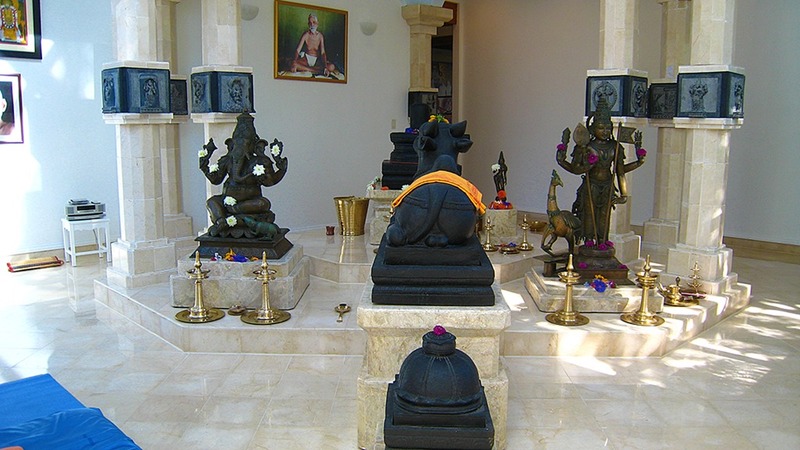 Here Raman, Sangeeta and Jayalakshmi attend to this. 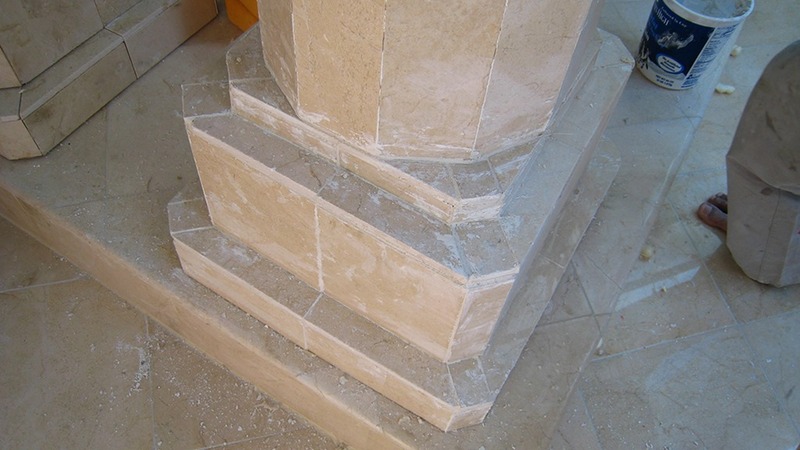 Nice final touch with the grout. 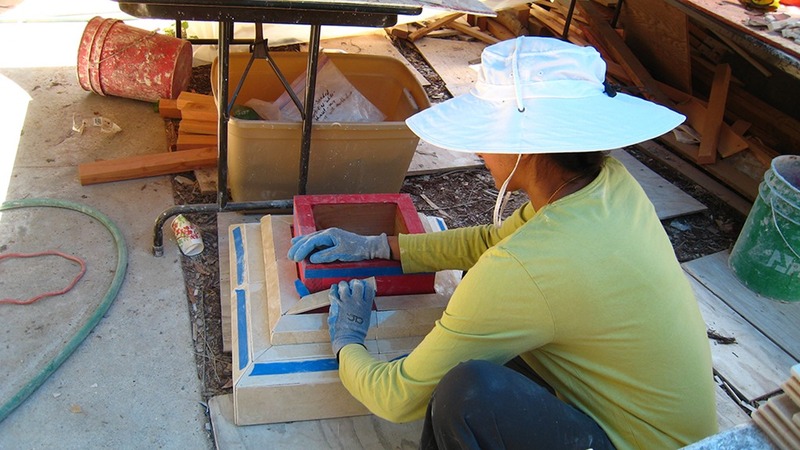 The story tiles will eventually be oiled so they will be black matching the black grout. 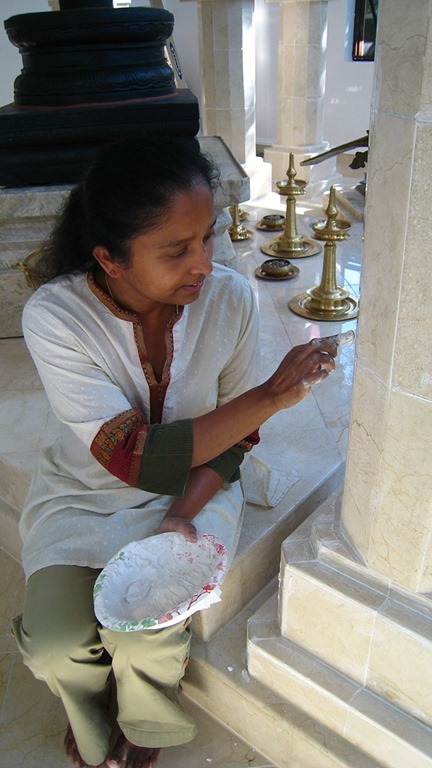 Siva does some cleaning up and the Sri Sadisvara Mandiram is beautiful! 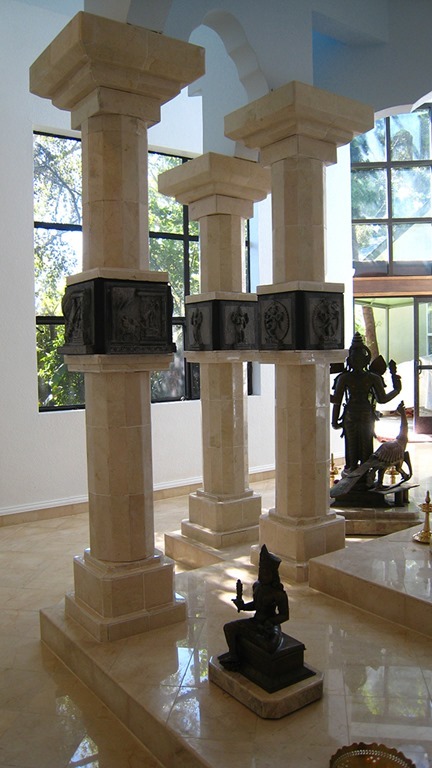 On the seven columns in the sadéçvara mandiram are depictions of forms of Siva and legends that pertain to him, as described in Siva Puranam (çiva puräëam)and other scriptures. 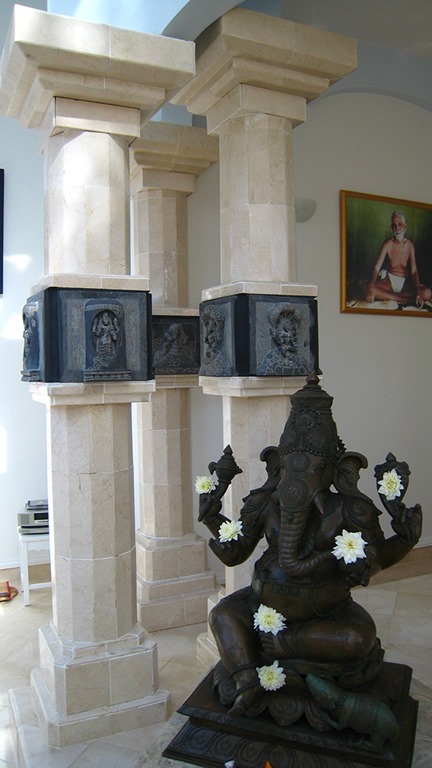 On the column to the immediate left of the çivaliìgam is Dakshinamurti; dakñiëämürti, seated underneath the banyan tree, revealing the Truth of Brahman in silence to the four rishi disciples sanandana sanatkumära sanatsujäta and sanaka. 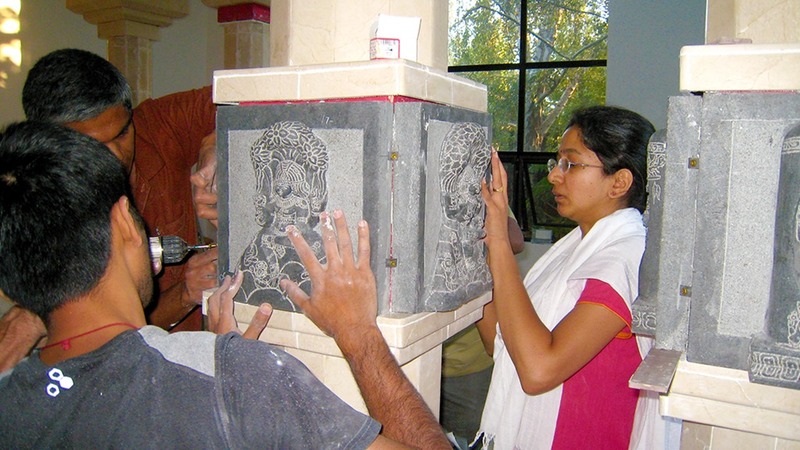 For more explanation of this, see Advaita Devatam. 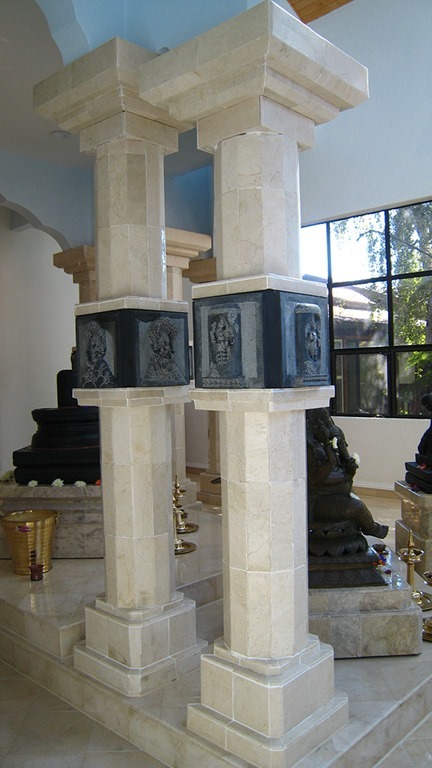 The next column to the left, which one passes while performing pradakñiëa (clockwise circumambulation while keeping the object of veneration to one’s right), displays the Lingodbhava; liìgodbhava and shows Brahma and Vishnu unable to reach the end, the top or bottom, of the illimitable, immeasurable Siva. 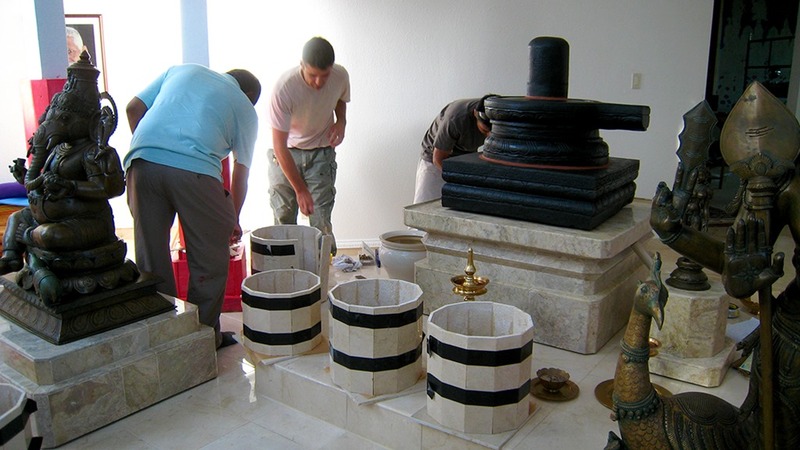 For more explanation of this, see Advaita Devatam. 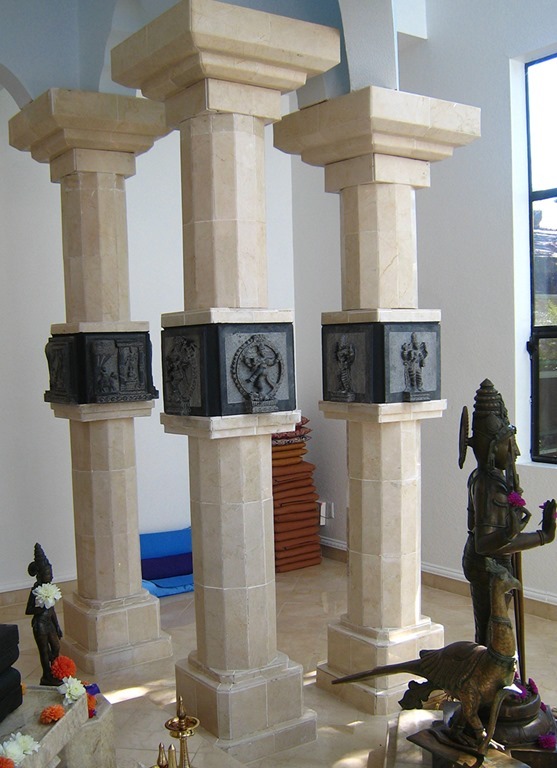 The next column depicts Siva saving all from the poison churned by the devas and asuras in their faulty attempt to produce nectar using the mandara mountain as a rod and väsuki as a rope. 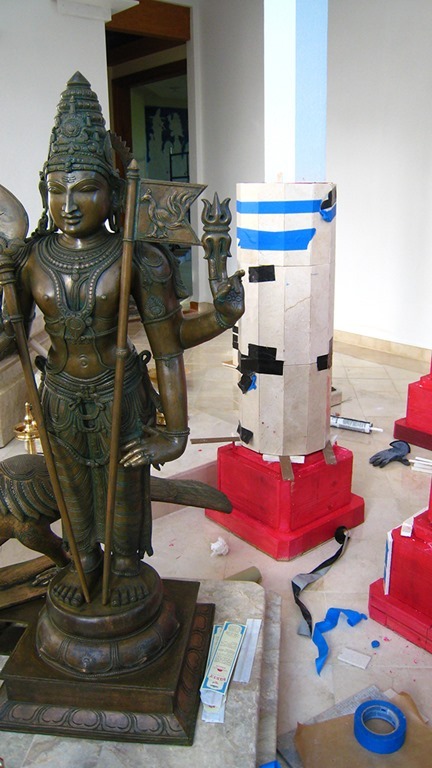 The next column displays Siva as the destroyer of the tripura-s; tripura, which may be understood to be any of the triads, including the three states of mind, with a single arrow. 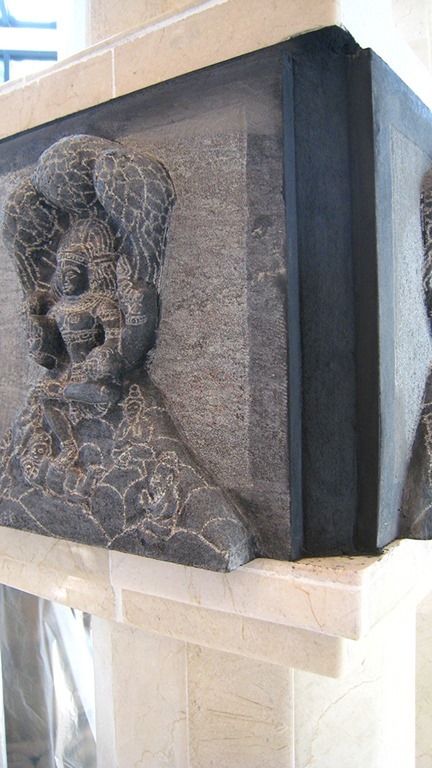 The next column shows Siva saving the devoted Markandeya; märkaëòeya from Yama; yama (death). 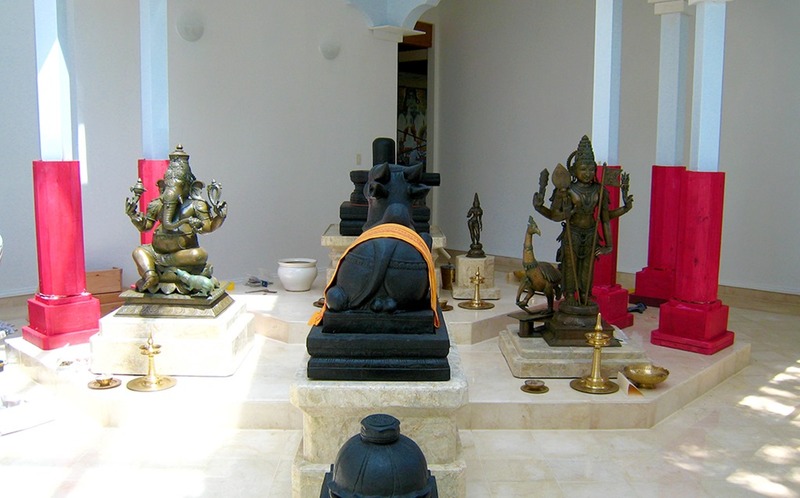 The next column depicts Ardhanarisvara; ardhanäréçvara, the indivisible one in whom difference, such as between Siva and Sakti, cannot be distinguished, and the final column displays Nataraja; naöaräja, the Lord dancing in transcendent space. 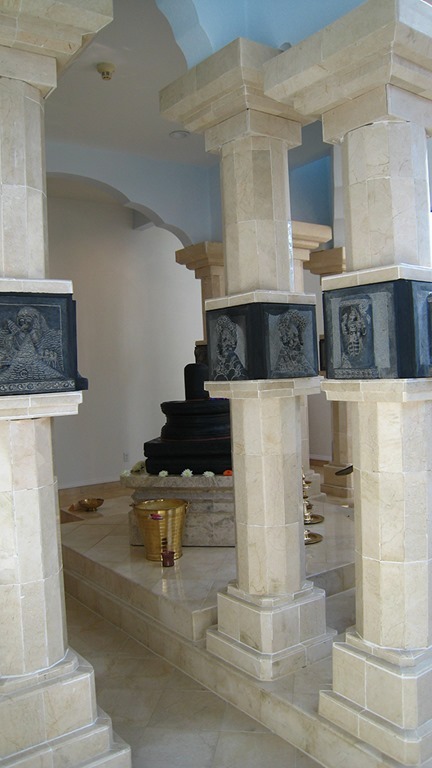 For an explanation of both of these forms of Siva, please see Advaita Devatam. 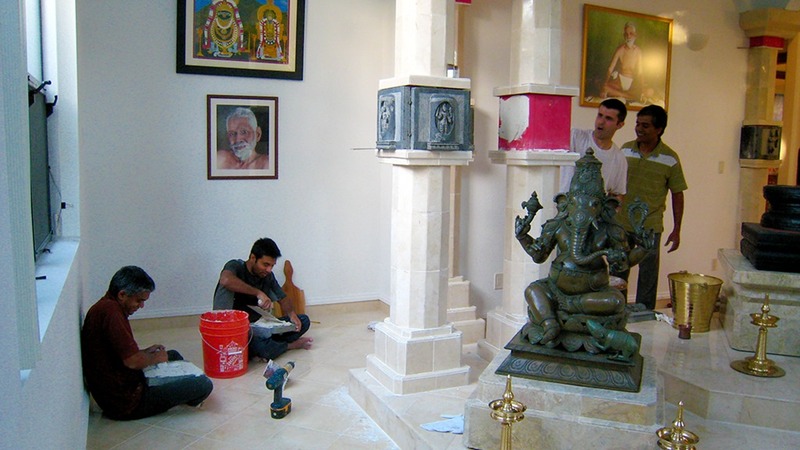 Ganesh, Ribhu and Dhanya apply a little grout where needed. 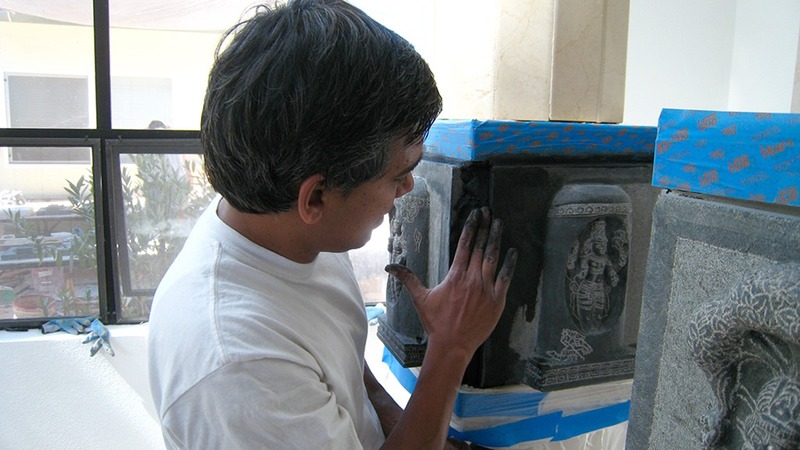 Final touchups. 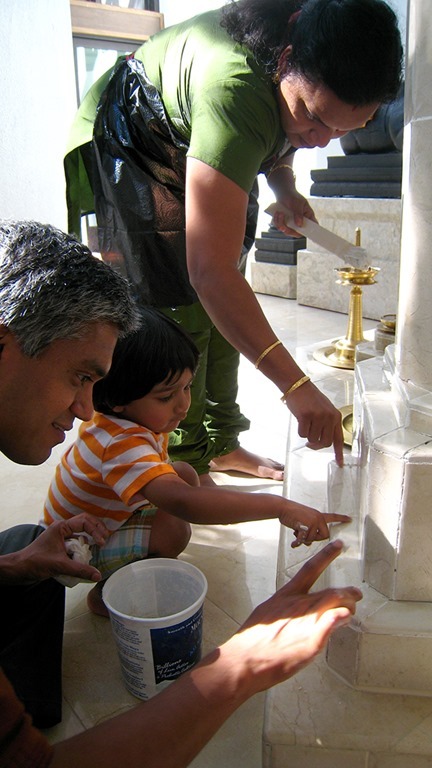 One final step in completing the Sri Sadisvara Mandiram . 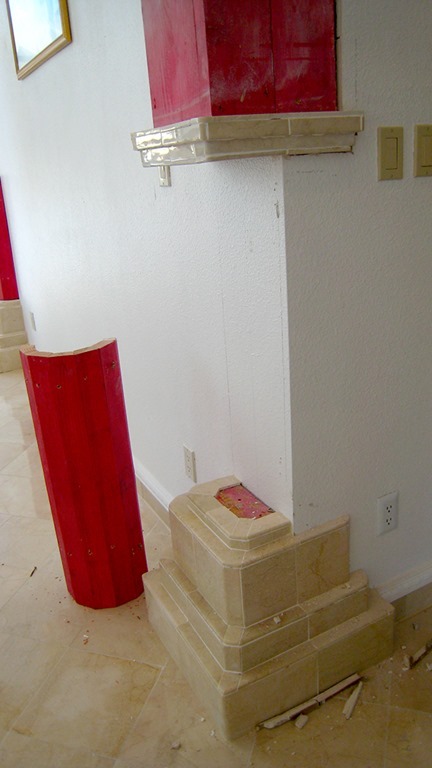 . . sixteen more story tiles will be adhered to the wall. 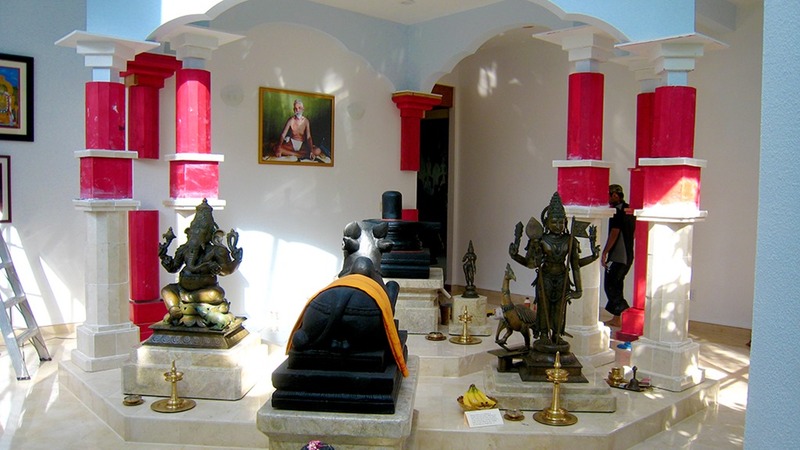 The story of Sri Ramana and the story of Adi Sankara. 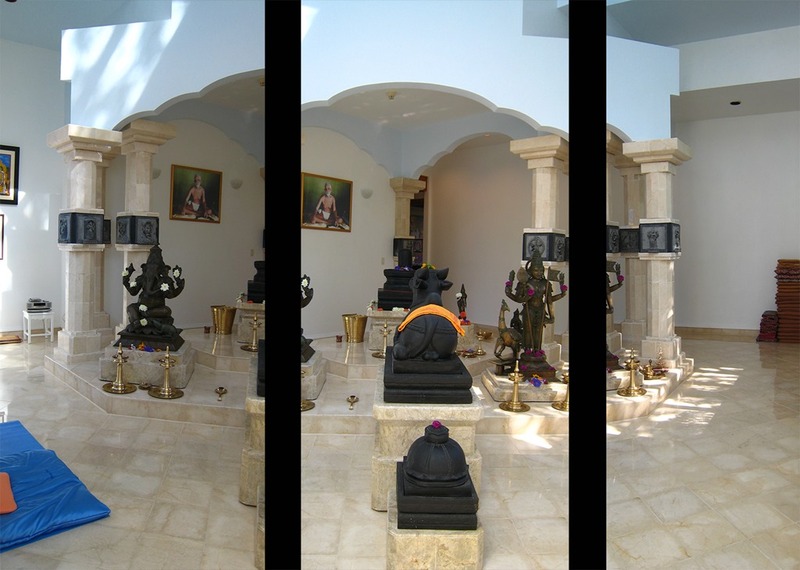 This will appear in the next Mandiram blog. 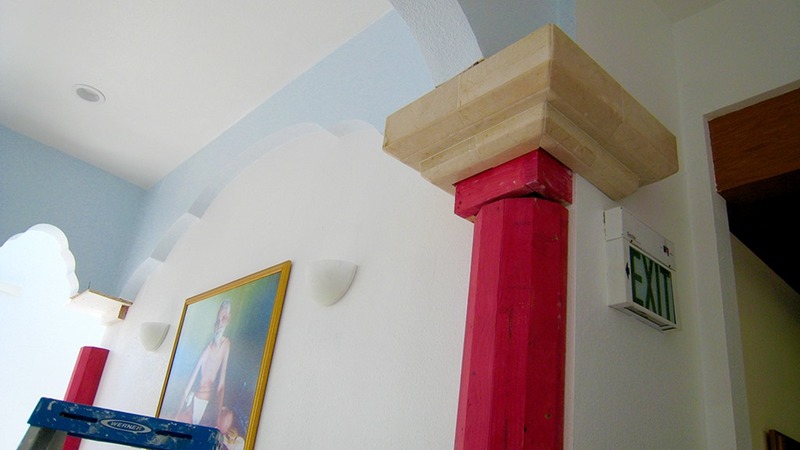 Wonderful to see the progress. 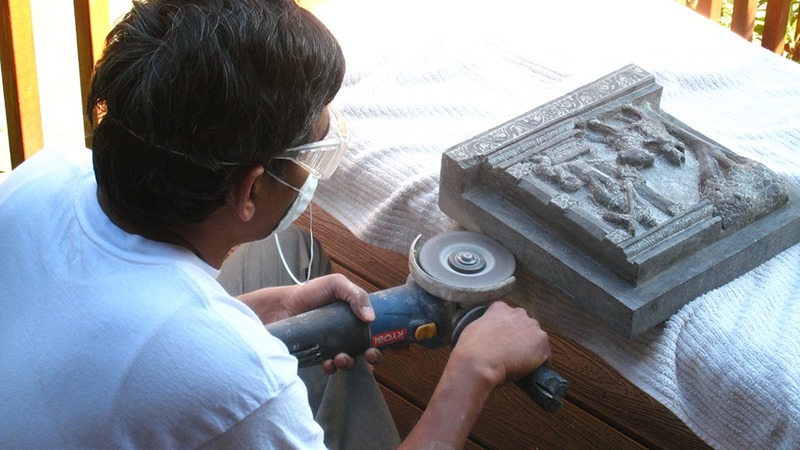 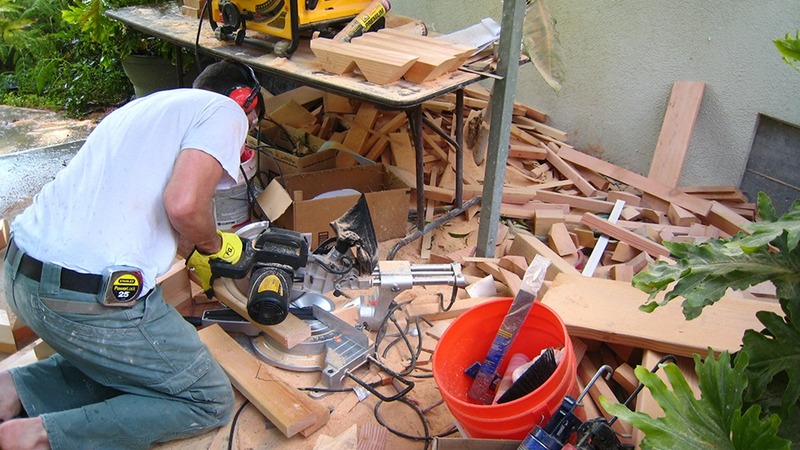 This post shows just how much work is involved, and the loving selfless service of the sangha at SAT. 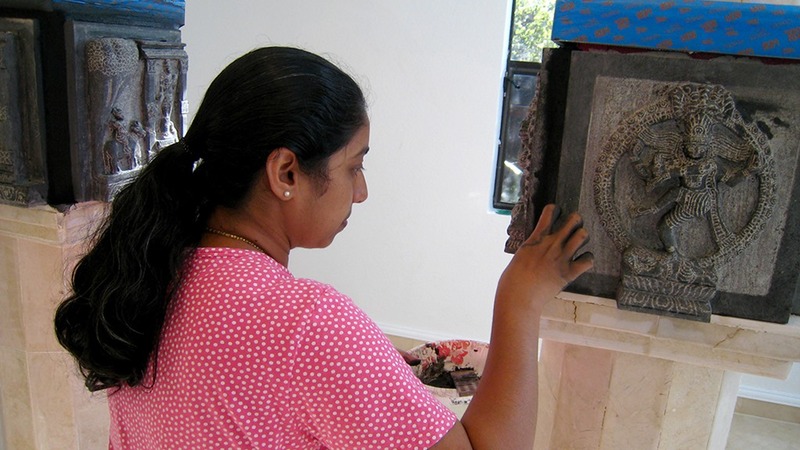 Thank you so much for this posting, and for the spirit behind this work.